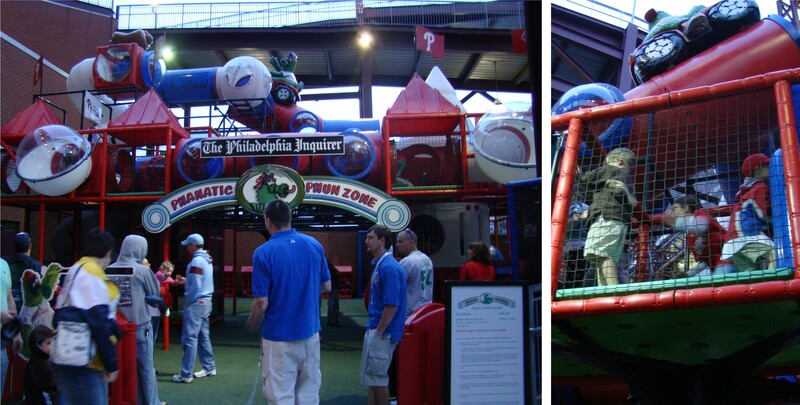 Top Left: Still in Philadelphia, Tim played in the airport play area. Top Right: Once in the plane, Tim strapped his trusty pillow (named “Pillow”) into the seat belt with him so Pillow would be safe on the journey. 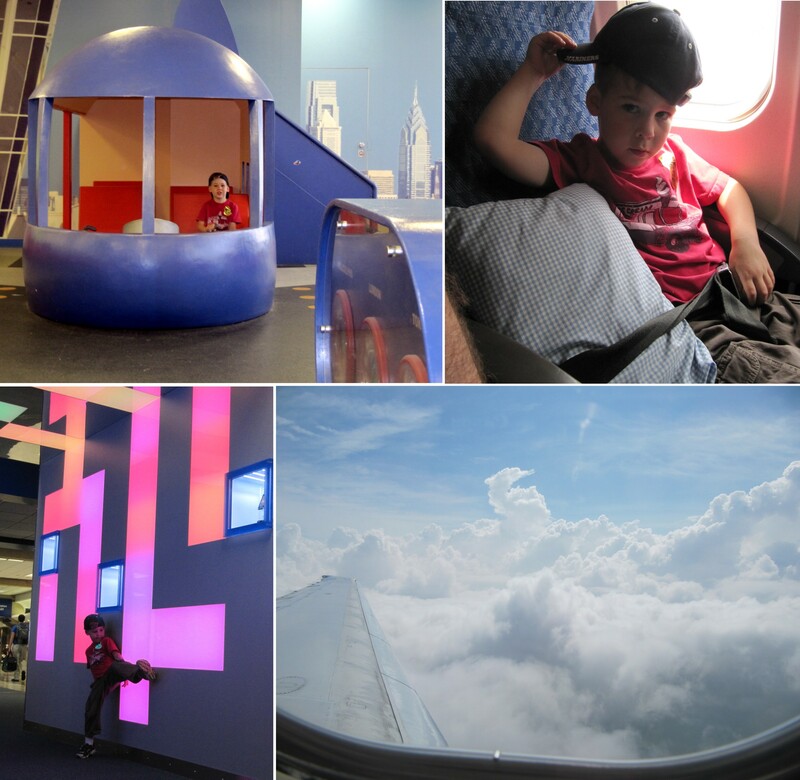 Bottom Left: During a stop-over in Dallas, Texas, Tim played in a light room as we waited for our second flight. Bottom Right: Approaching San Jose, we saw a seahorse cloud out of our window. 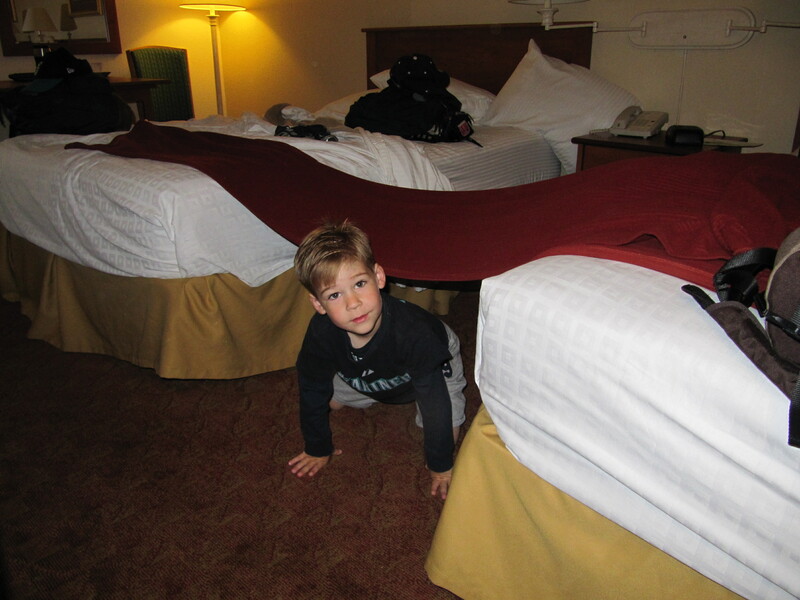 Grandpa picked us up in San Jose and we drove up to our hotel in Oakland to relax before our first game. 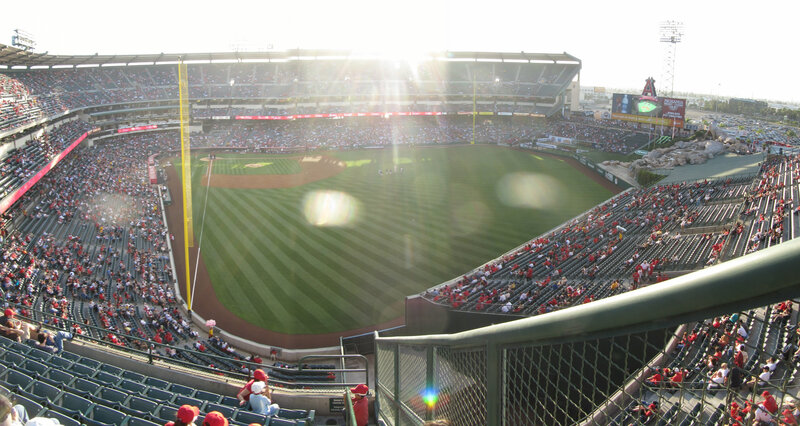 We’d originally planned for our first game to be on June 10th. 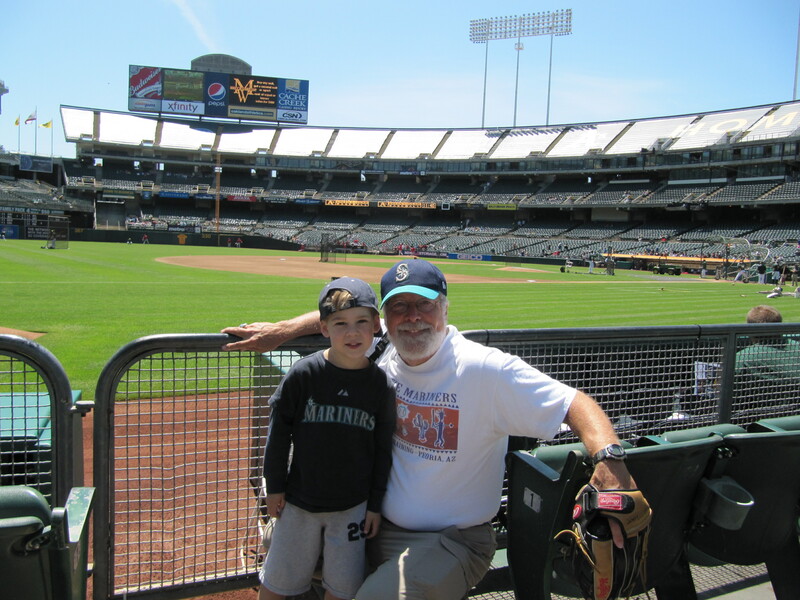 But that game was a 12:30 p.m. start so we had to fly in on the 9th, and the 9th featured $2 tickets at the Oakland-Aladema County Colesium, so we decided to add the June 9th game to our schedule as well. Now, I like to stay positive on this blog and I intend to do my best here. 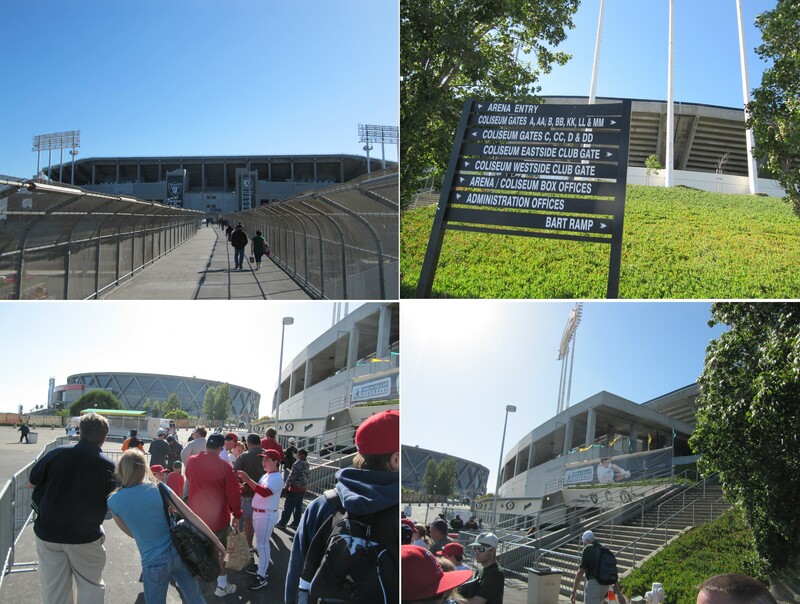 But the razor wire lining the fence immediately outside of the Colesium should have been our first clue as to the quality of the stadium. 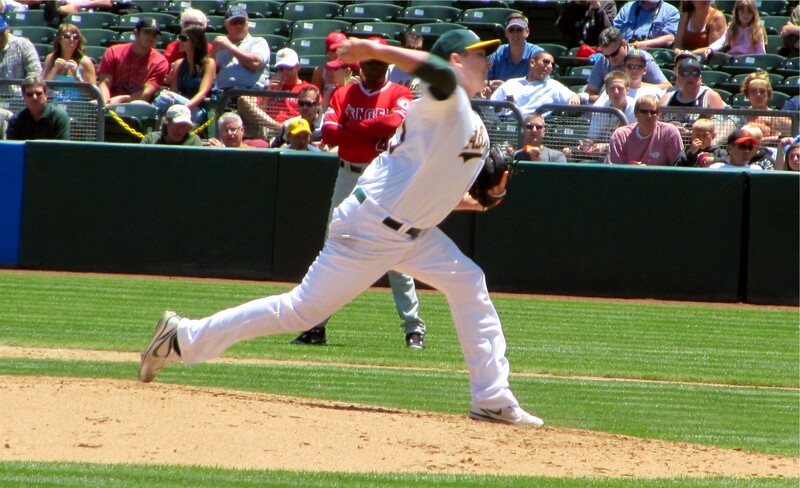 Before we get into the meat and potatoes of the game report, I’ll just share with you my conclusion from our two games in Oakland: plain and simple, the A’s need a new stadium. 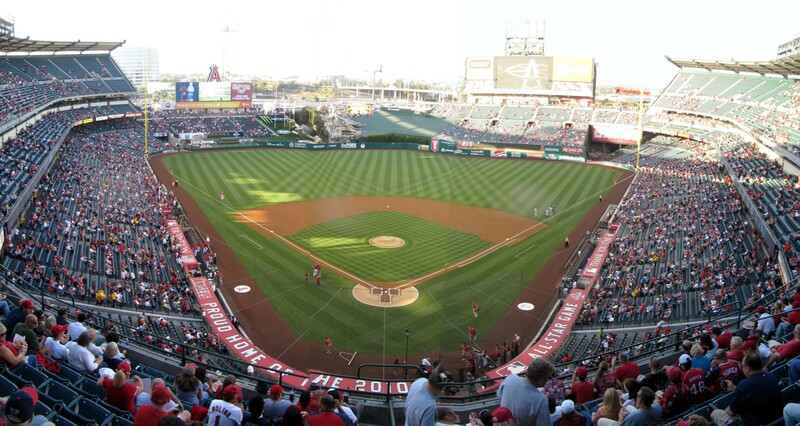 The field of play itself is beautiful. But everything else about the place is lacking. 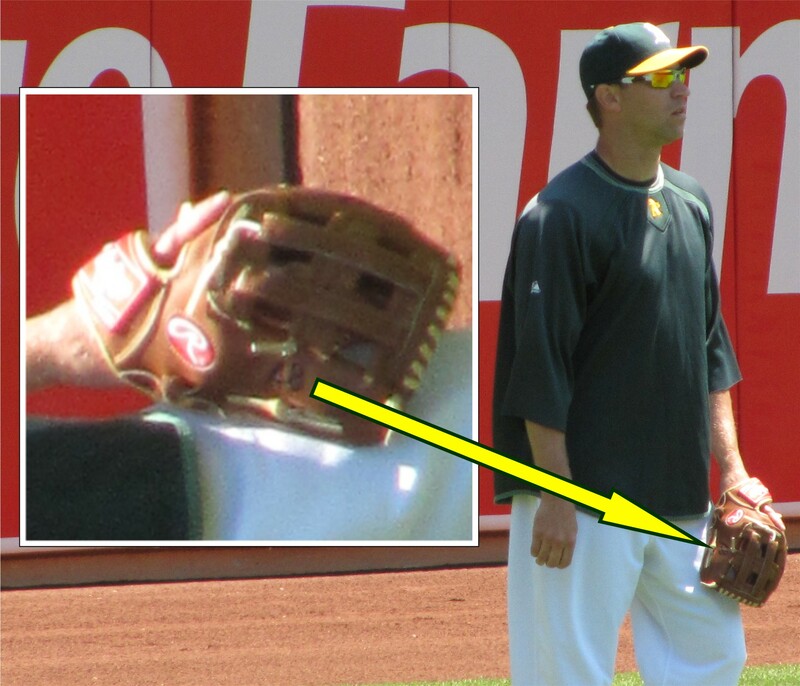 Seriously, at times I felt embarrassed for the A’s. 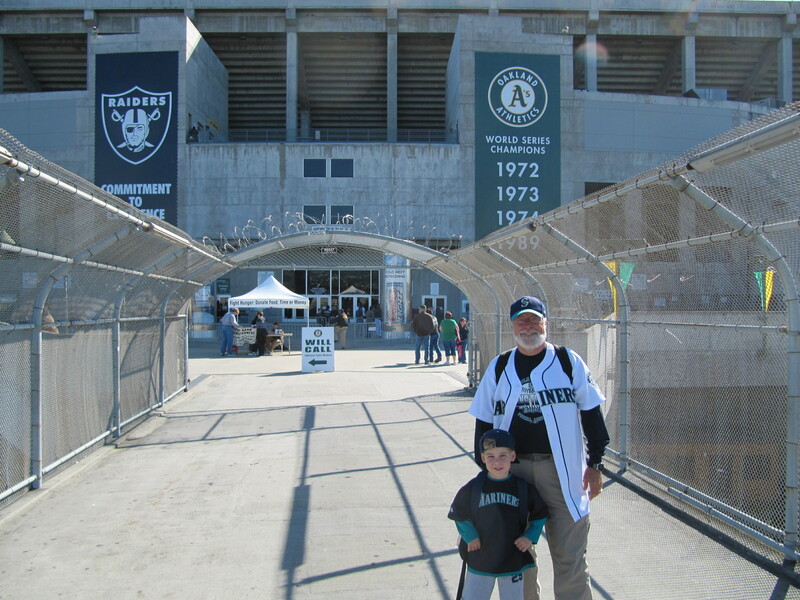 Their team is playing some decent ball this season, but the fans in Oakland deserve better than ownership is giving them at the Colesium (on many different levels). 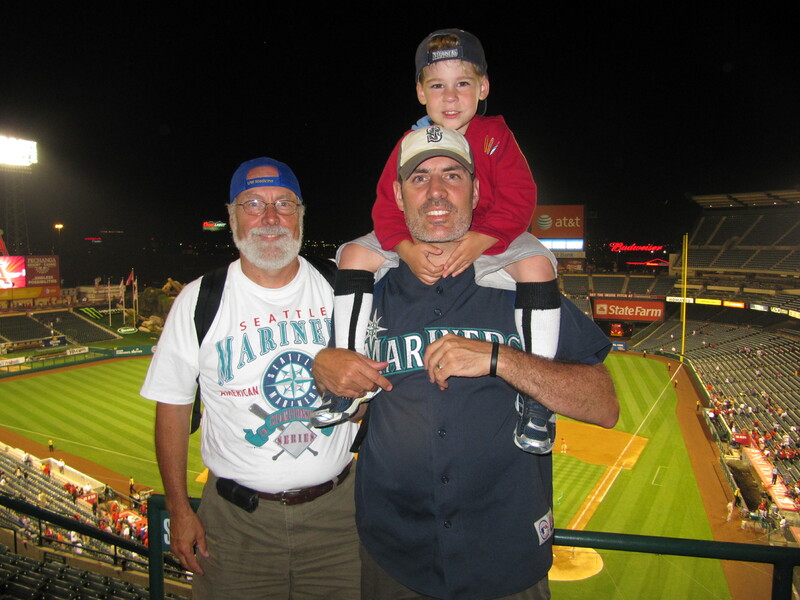 That being said, don’t get me wrong, I thoroughly enjoyed these two games with Tim and my dad — even though the games featured two of the Mariners A.L. West opponents (resulting in me wanting both teams to lose). 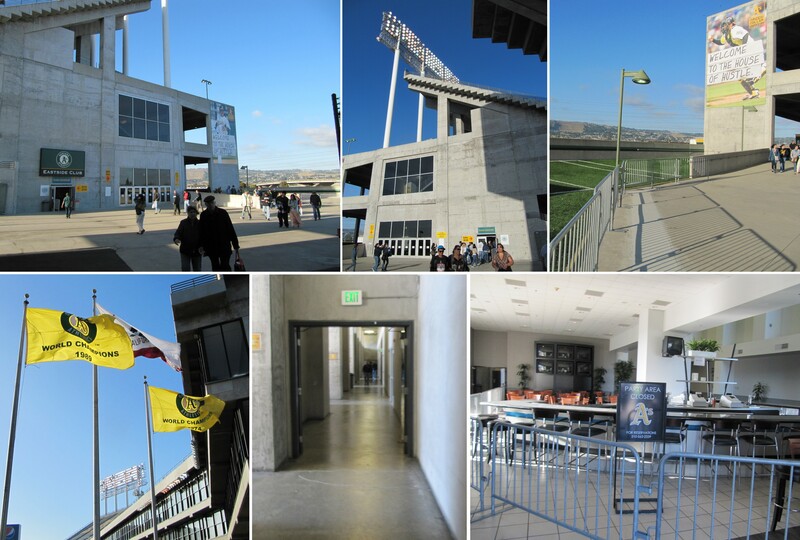 Here are some pictures of the outside of the stadium. I don’t think those picture need much explanation. 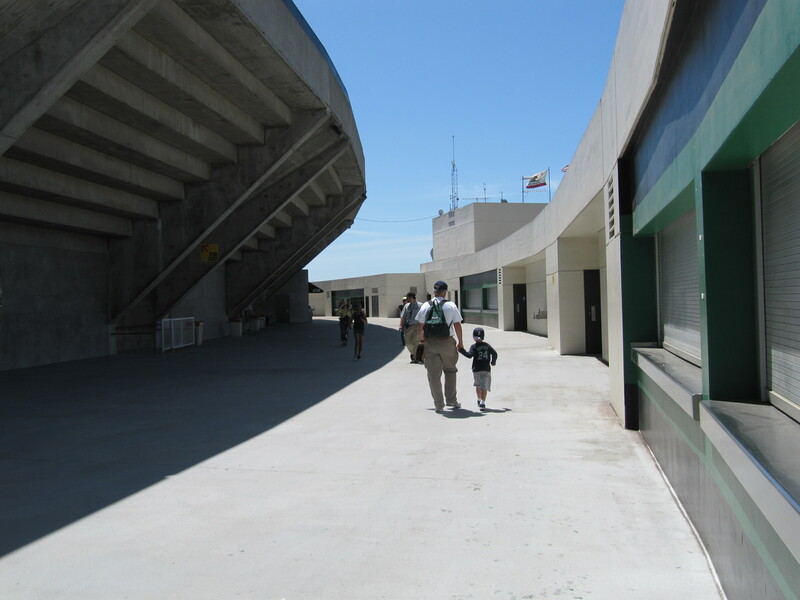 I’d just note that we walked around the outside looking for a spot to take a picture of “the stadium.” But everywhere we walked, all we saw was a bottom side of big cement steps. 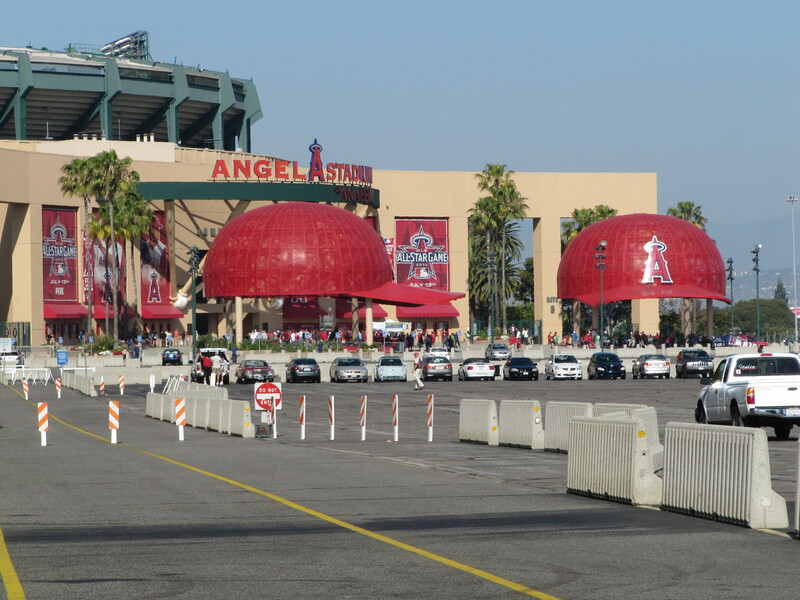 Seriously, there is nothing that says “MLB Stadium” about the outside of the Colesium. 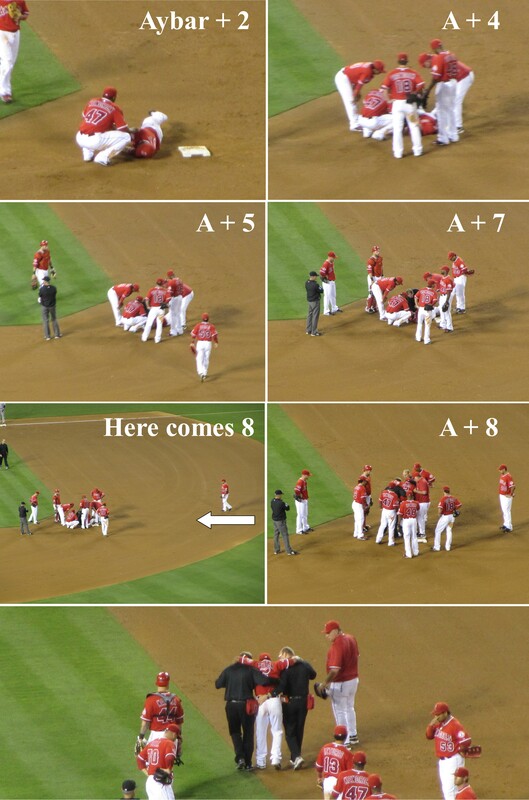 One more comment about those pictures, see the kid in the bottom left picture wearing the full Angels uniform? 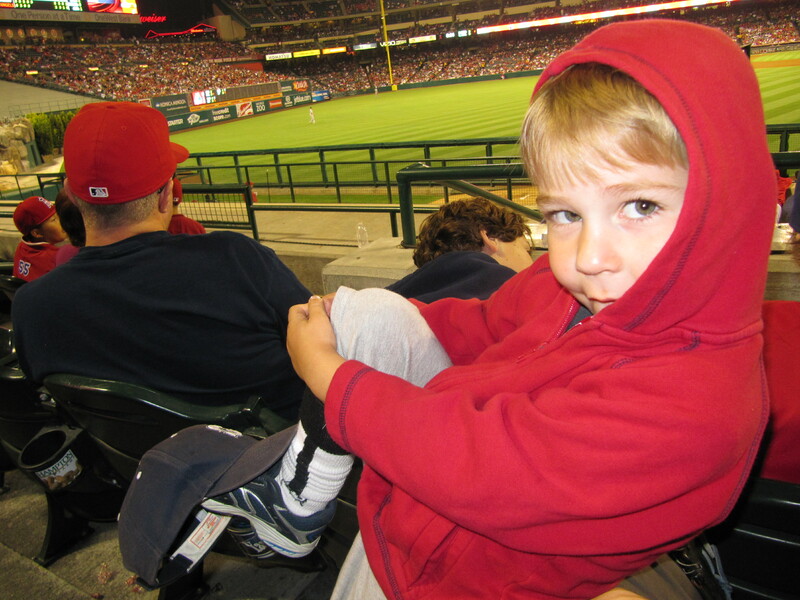 We saw him both days in Oakland and the kid was decked out in a full, legit-as-they-come Big League Angels uniform. 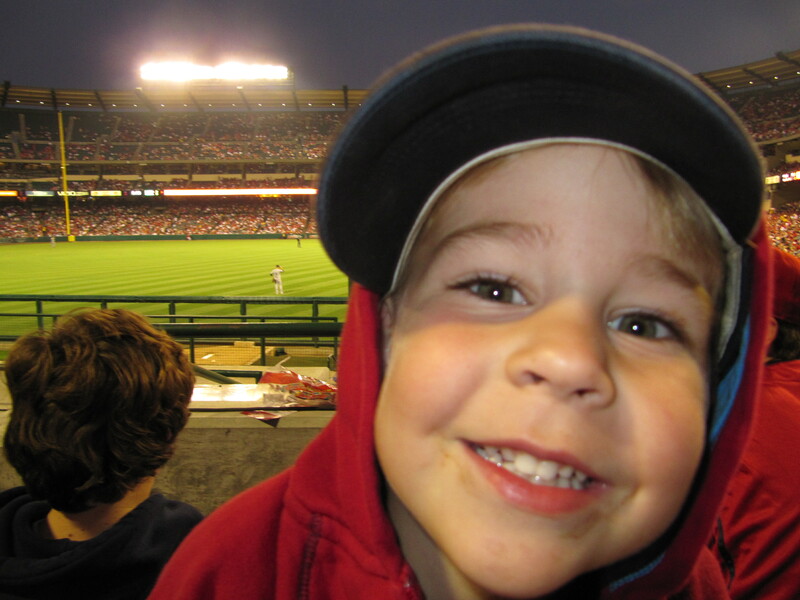 Undoubtly, a big Angels fan. 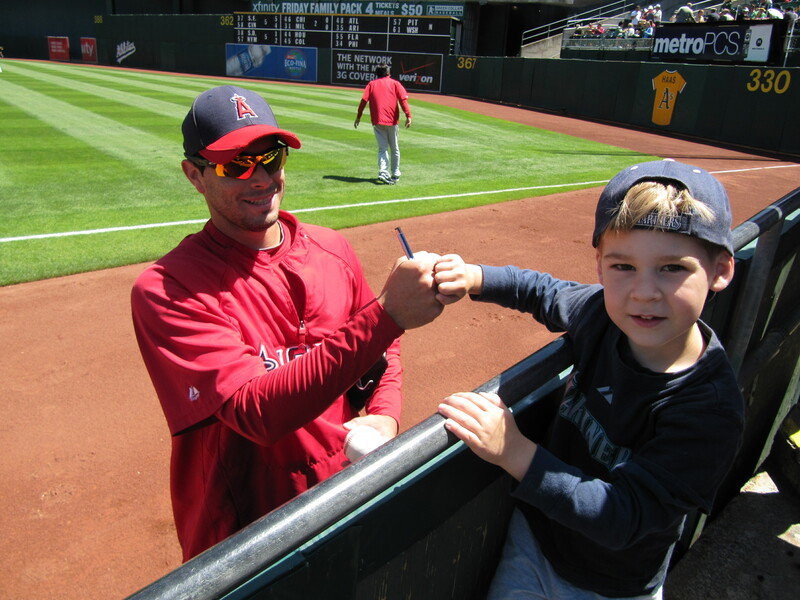 Good to see, kid. I hope he enjoyed his time at the games. 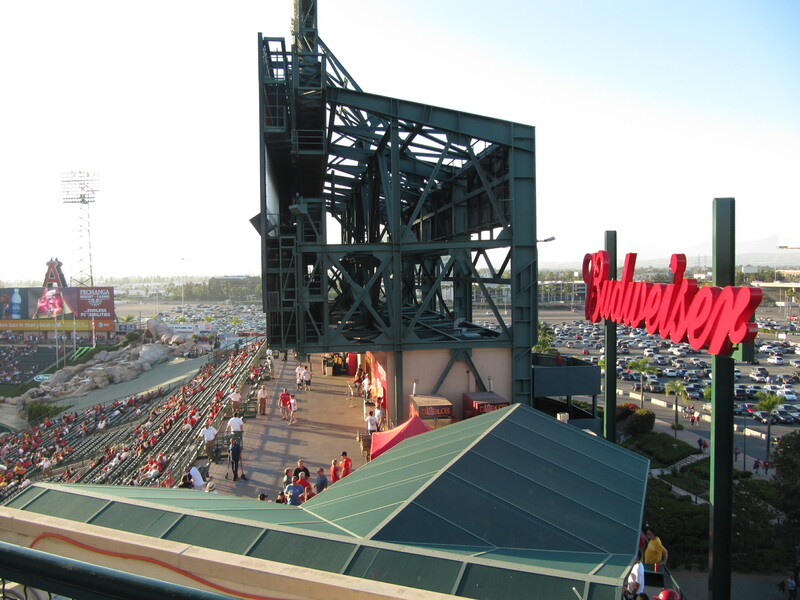 Straight away (by the “WELCOME” sign) is the field level concourse. 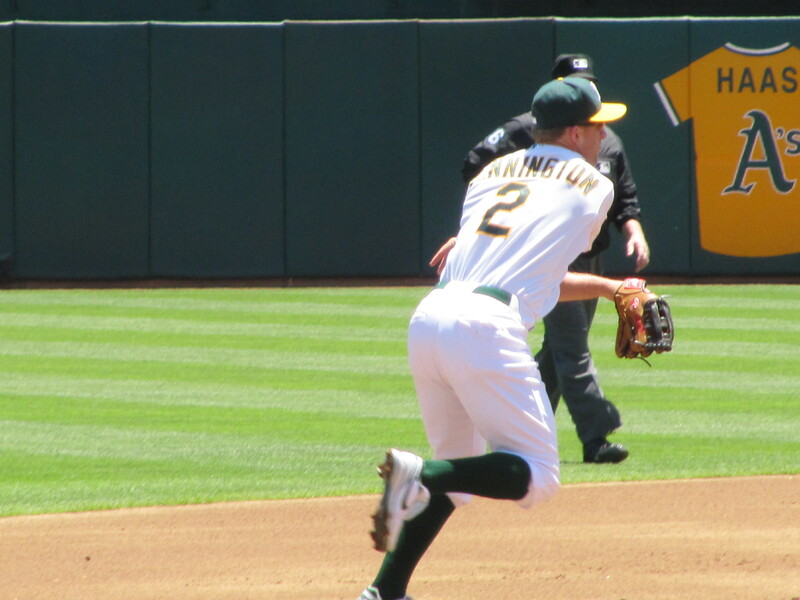 This entry brings you in around the seats behind 1B. 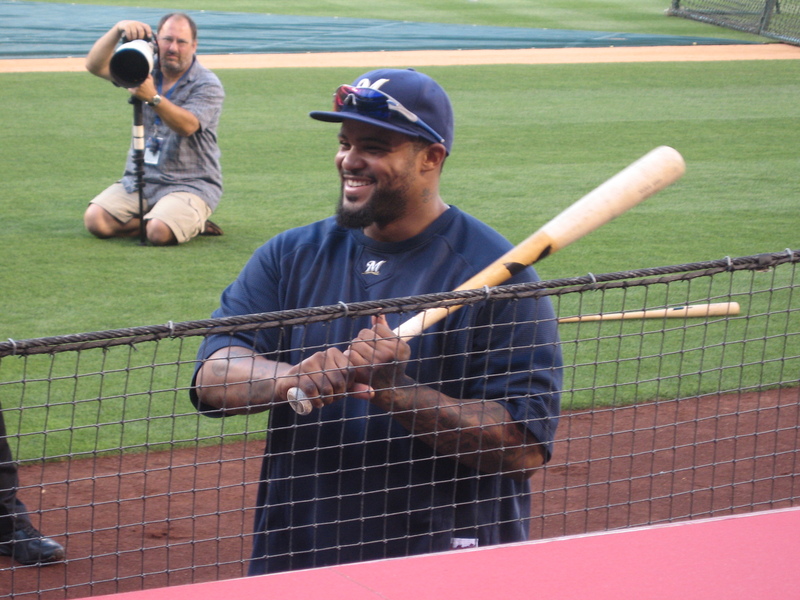 …we saw former Mariner Joel Piniero hanging out in deep RCF. 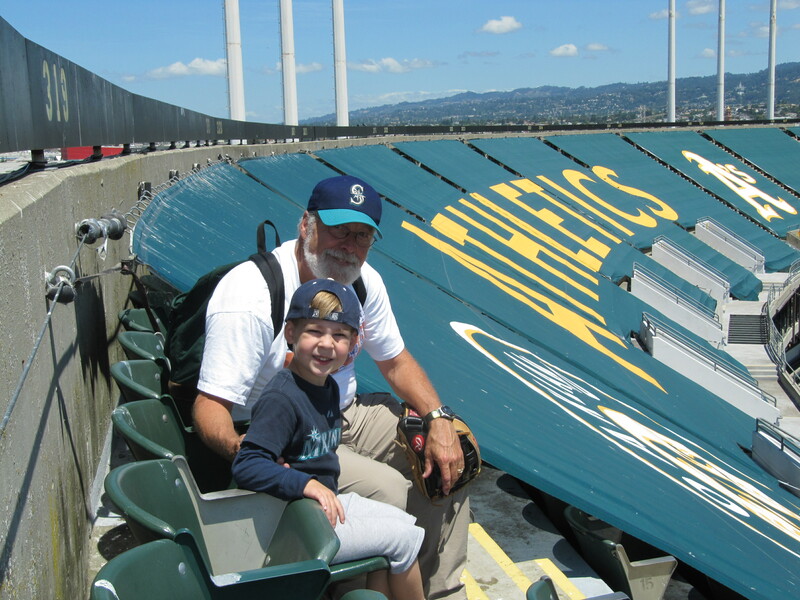 My dad decided to go up to the RF bleachers. In the picture above, my dad is standing under the top yellow arrow. Piniero was hanging out (off camera) by the tip of the lower yellow arrow. 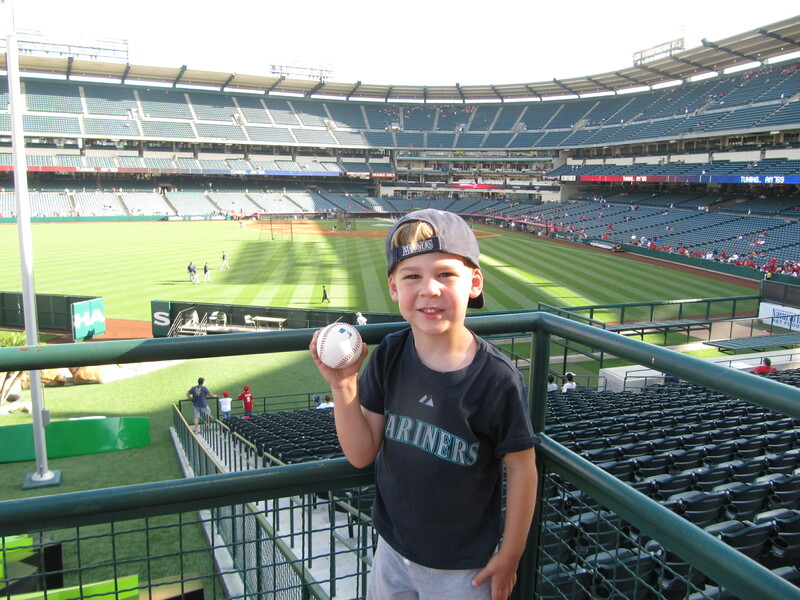 Soon, Piniero made a high toss up and my Dad came away with the first baseball of the 2010 GFS Roadtrip. 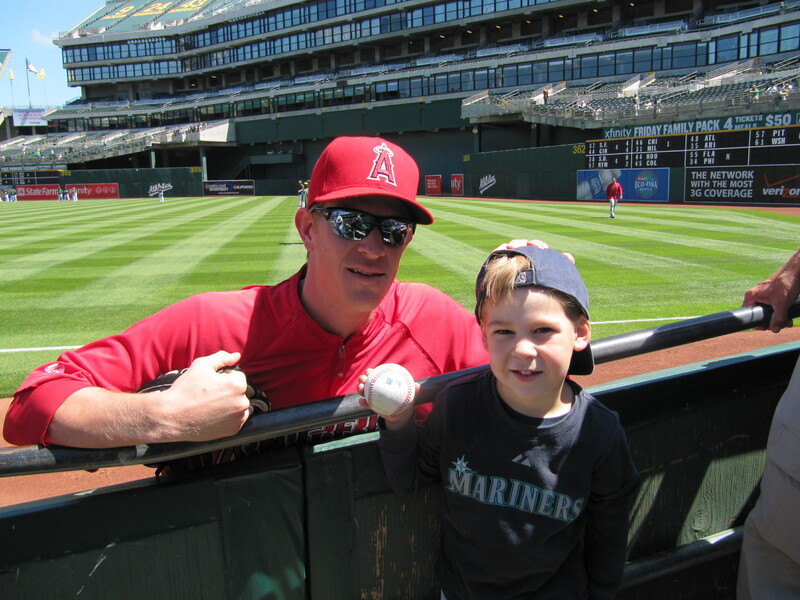 Finding the former Mariner, always an excellent plan! 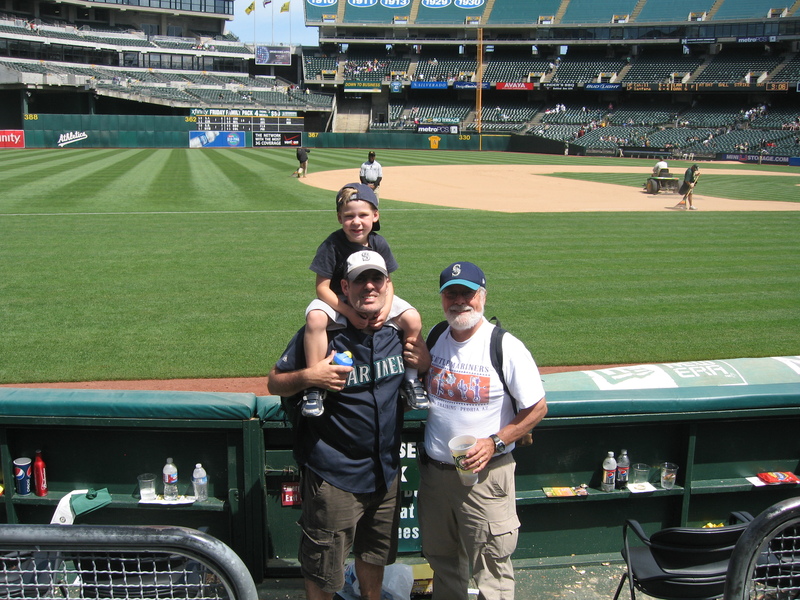 By the way, on $2 ticket night (which did not include the bleachers), my dad had to talk his way into the bleachers during BP and promise that he would not stay there during the game. As you’ll see, he kept his promise. 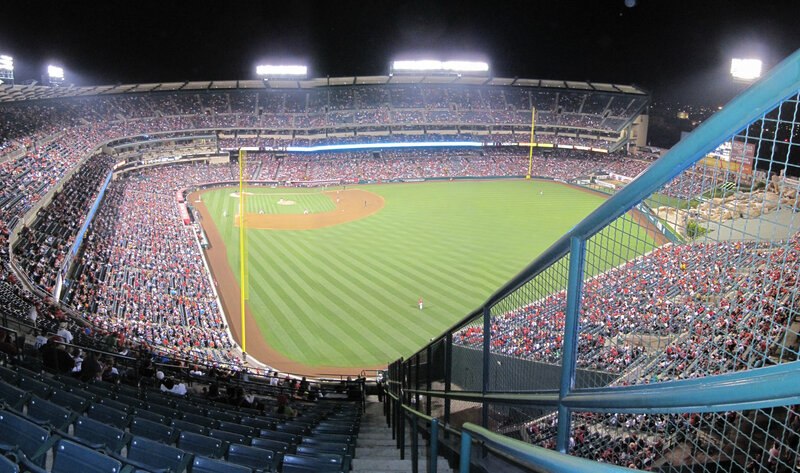 …soon we headed to the field level seats that wrap around the foul pole, right behind a special BBQ party deck (above to the right). 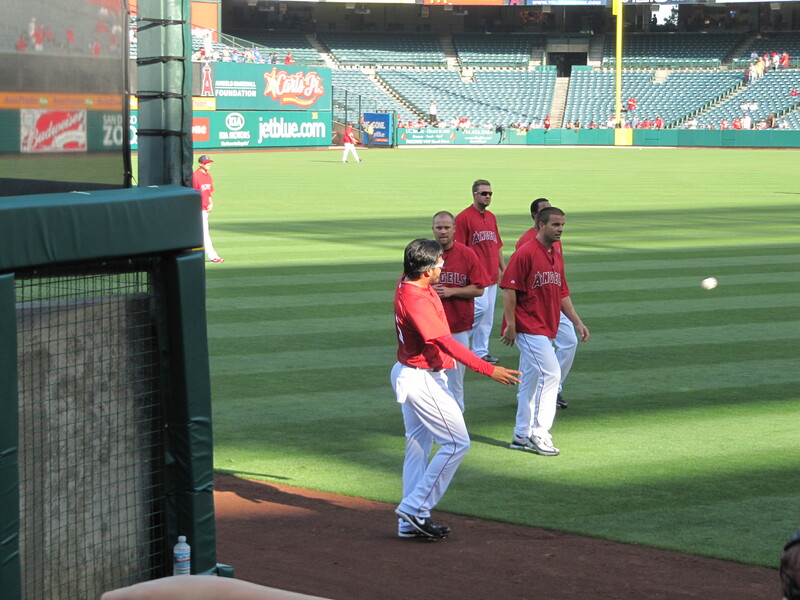 The gates opened 1.5 hours before the game, so BP was already going on when we got into the field. 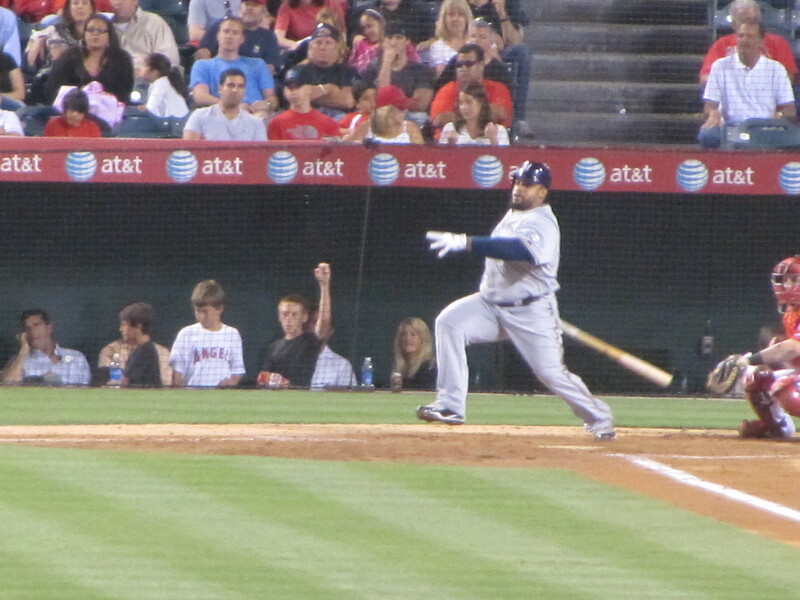 As we were out in RF, not a single homerun reached the seats (I think in the whole stadium, not just RF). 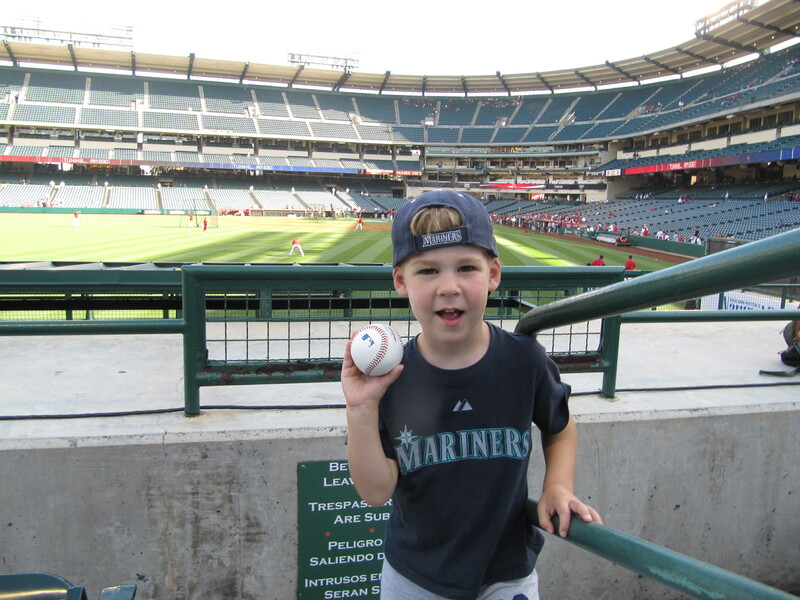 But at least one did before we showed up, because a stadium worker came up and gave Tim a BP baseball. 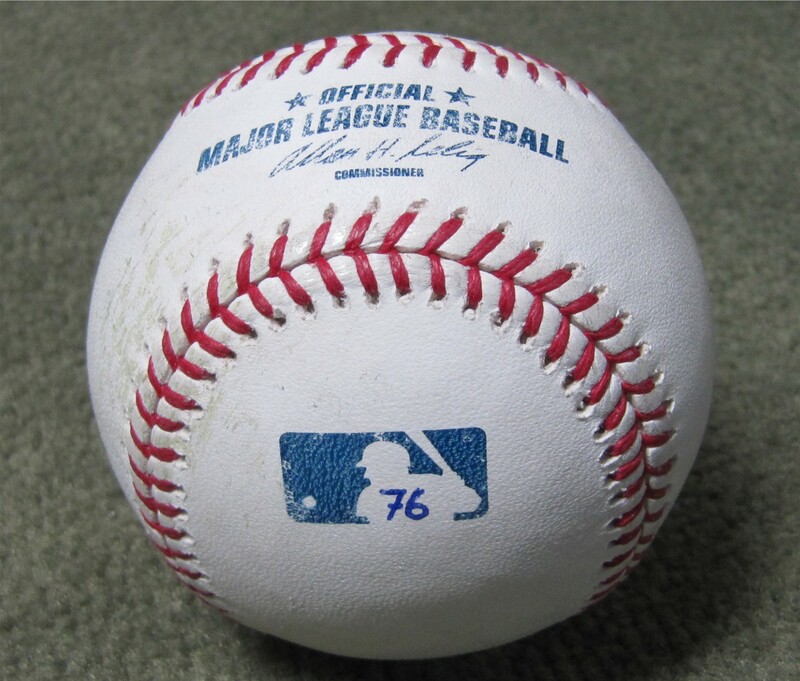 Now, we’re not real “ballhawks” so, you know what, we’re counting this stadium worker ball. We came to a game. 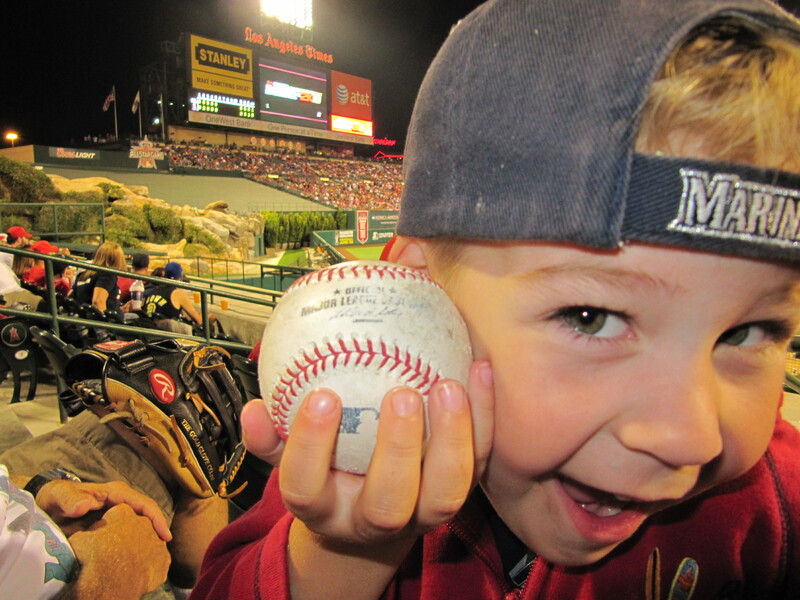 Someone employed by a MLB team gave us a baseball that had been hit during BP by a MLB player. So, yep, that counts in our book. It was absolutely hilarious. Everyone in the section (which was about 10 people) and the photographer all cracked up laughing at Tim. 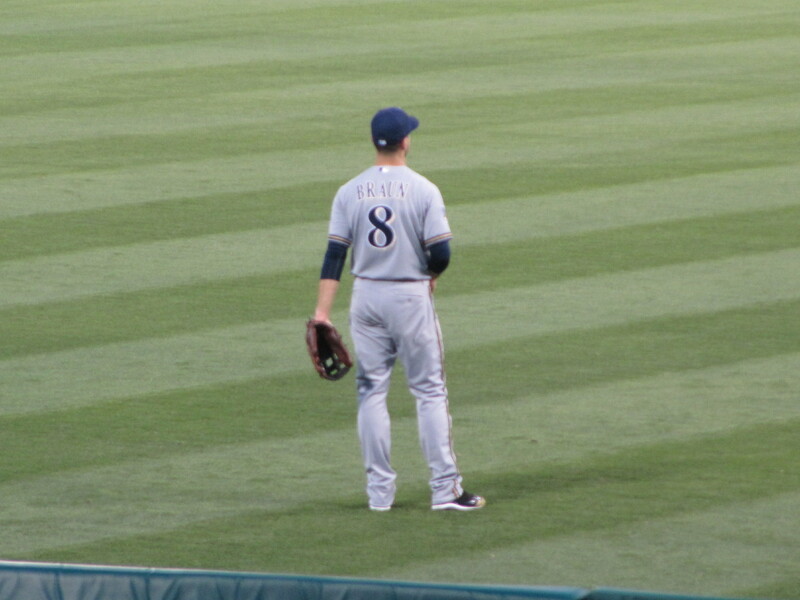 He took another picture, and Tim yelled “Ichiro!! !” again. 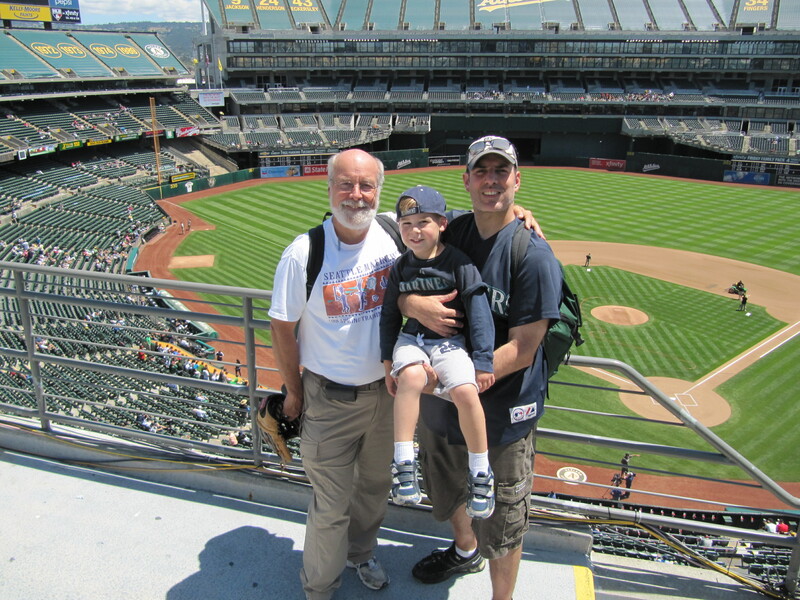 Just for kicks, to see the (better) picture that the guy took as Tim yelled “Ichiro!! !” at him click here. 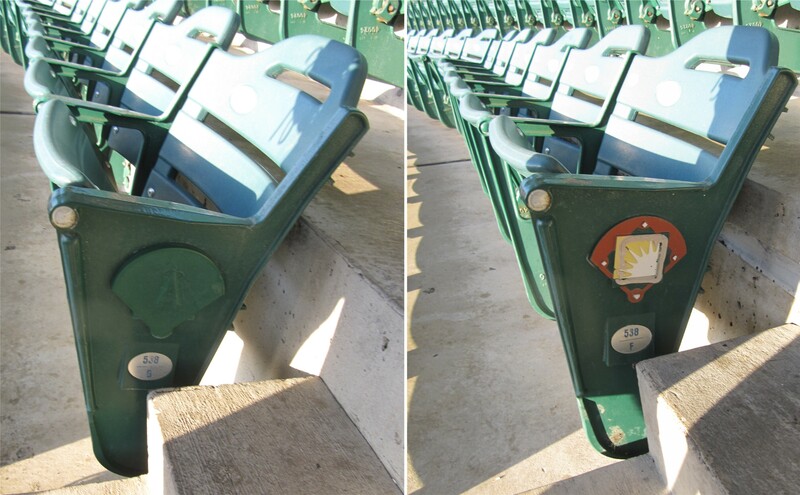 Left: random blue replacement seats were scattered throughout the green seats. 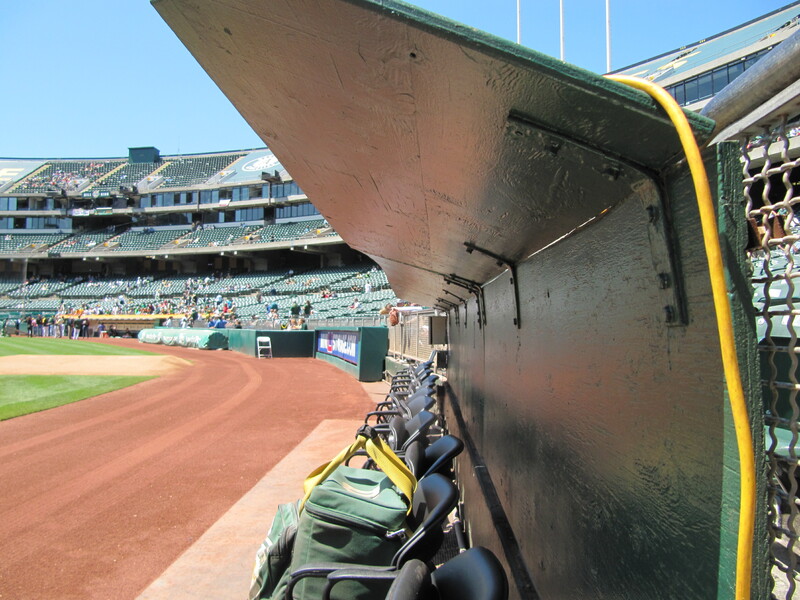 Right: As Tim walked through the seats approaching the 1B (visitors) dugout, we noticed that the springs on many of the seats are worn out. This results in two things: (1) the seats stay in the “sitting” position whether or not someone is sitting in the seat and (2) if you try to move quickly through the rows of seats, you will bash your legs on the seats and end up with lots of bruises. 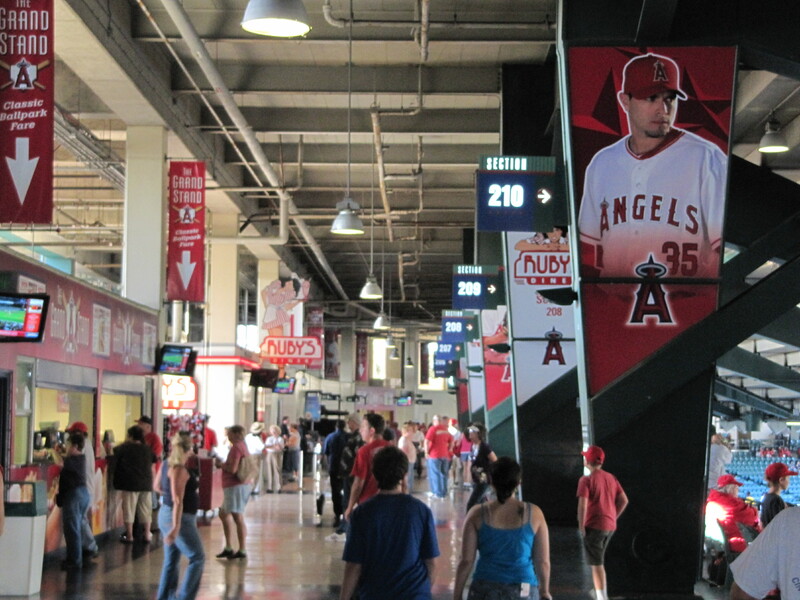 Next, we headed into the field level concourse to pick up some dinner. Generally, I thought the concourse was alright. 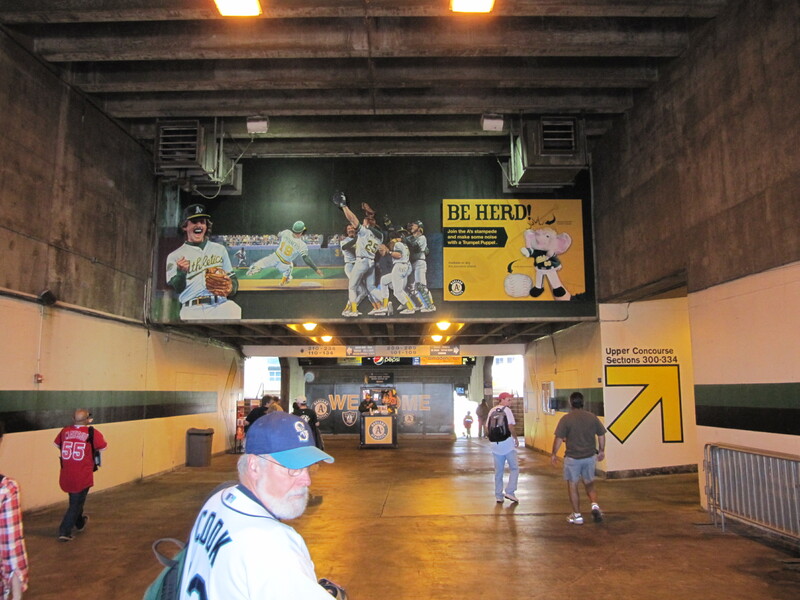 I grew up in the Kingdome and I can appreciate a no frills concourse. There seemed to be a lot of different food options. So, not bad. 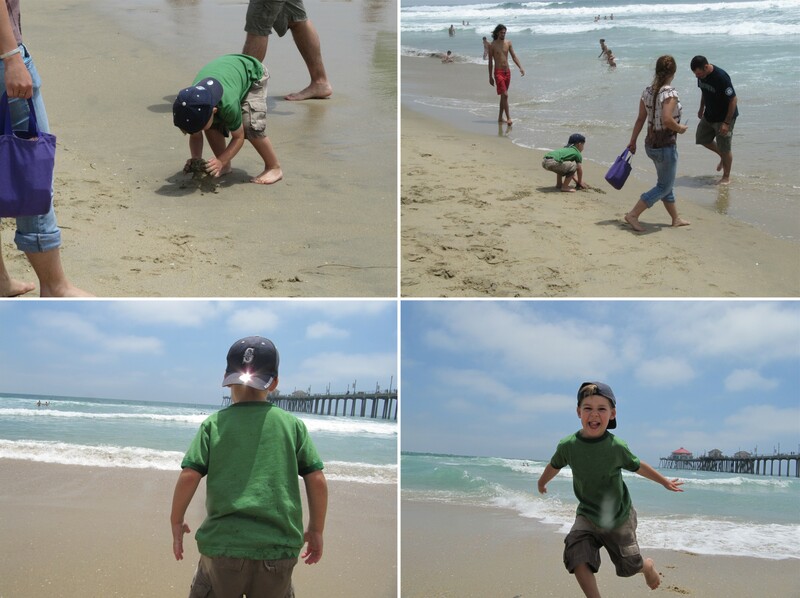 Here is what it looked like:. 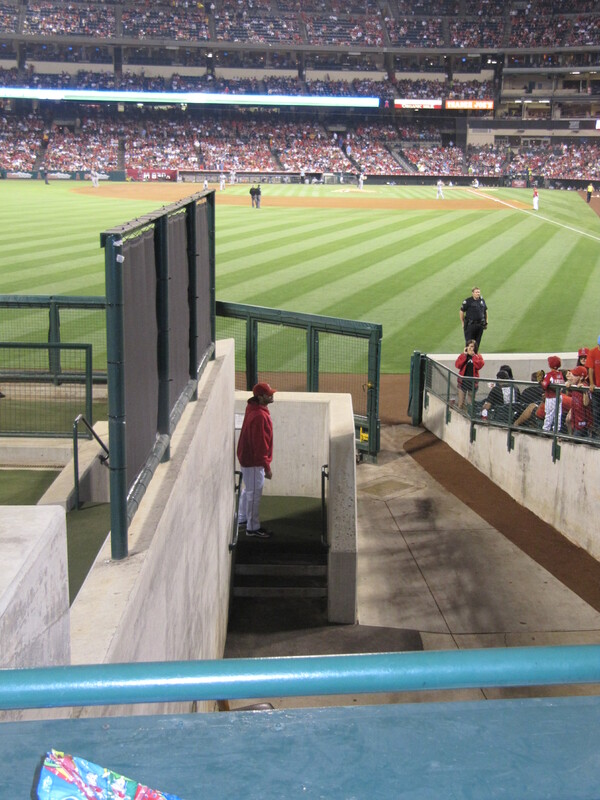 The stairs lead up to the 200 level, which I thought was kind of cool. 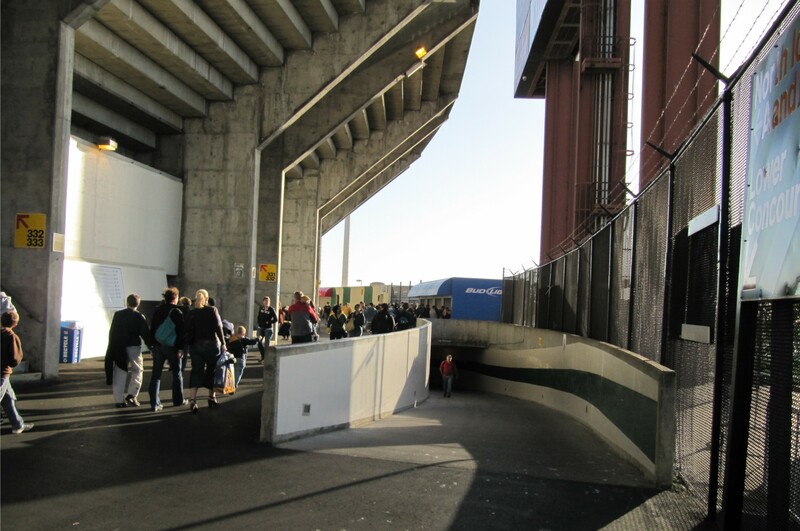 People in the 200 level can access two different concourses. But see the open areas on either side of the stairs? 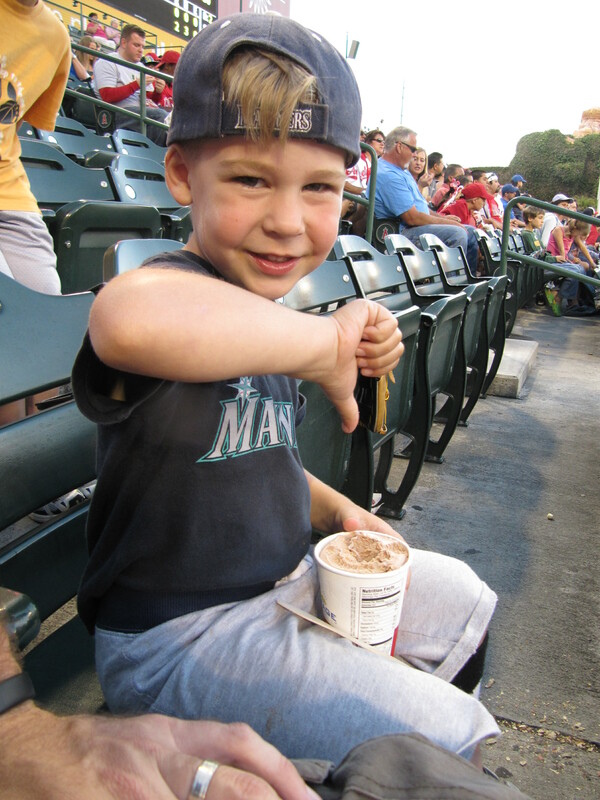 They should be open concourses where fans could watch the game while buying a hot dog (or an ice cream helmet). 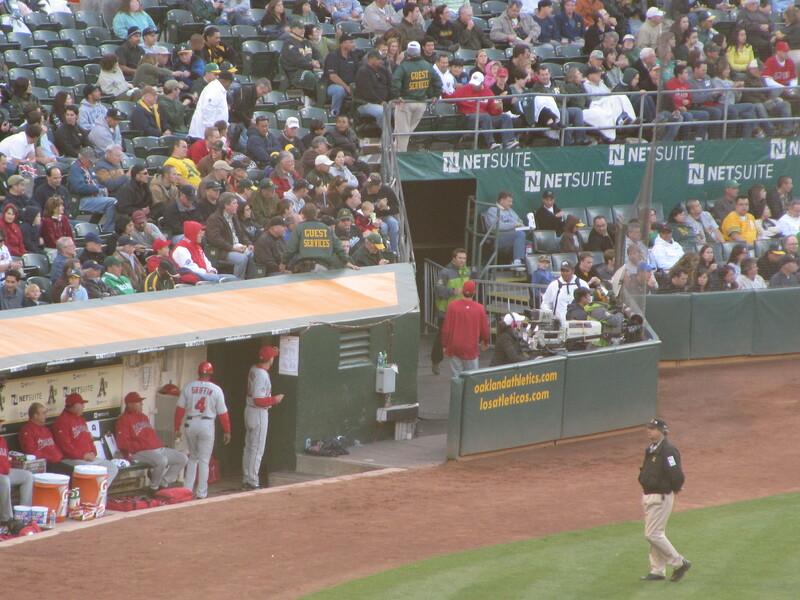 But the A’s have put in what appear to be “after market” partitions that block the view of the game for people in the concourses. 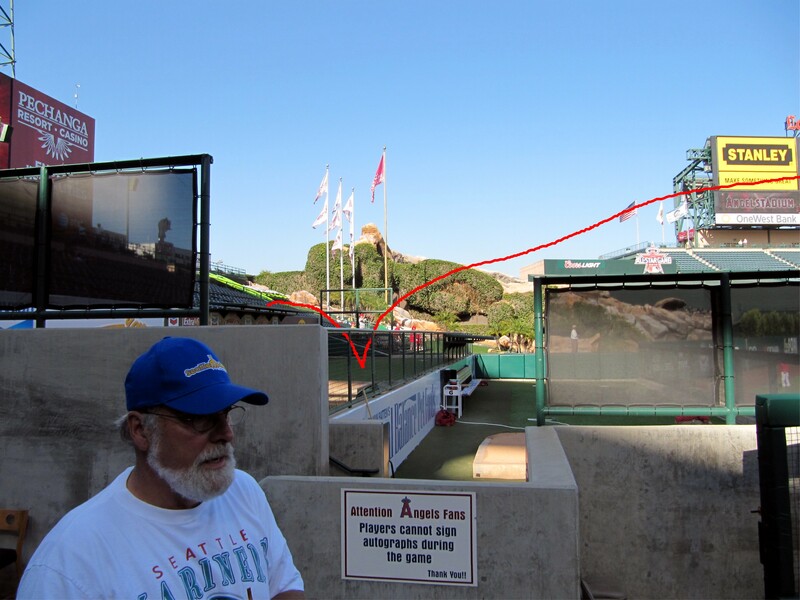 On the left, you can see the partition is simply a chain link fence with plastic slats weaved through the fence links. On the right, the partition is a solid wall that has been bolted into place. 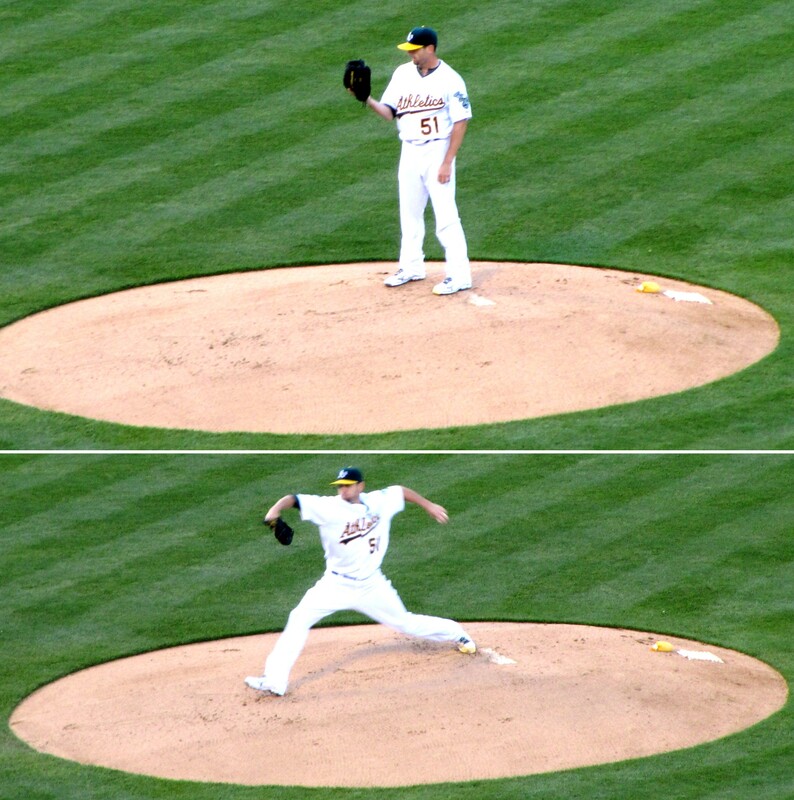 I have no clue what the A’s were thinking when they put in these partitions. They are a terrible idea. 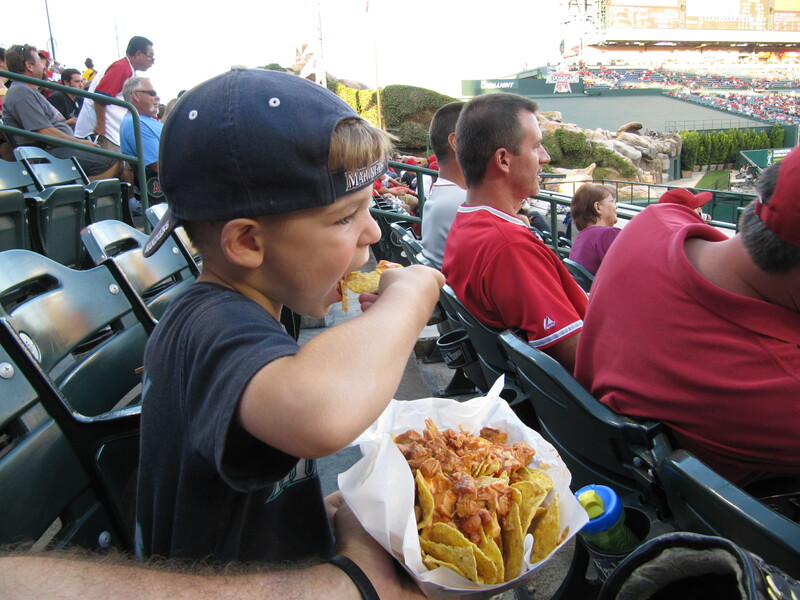 We grabbed some nachos and dollar hot dogs (Wednesday games are $2 tickets and $1 dogs) and headed up a ramp to the 200 level to eat dinner and watch the grounds crew prepare the field. TODD: “Are you serious, its like an hour before the game.” (I overestimated a bit, but hey, it was at least 35 minutes before the game and NO ONE was sitting in the whole section). I seriously could not believe this. I’m pretty sure we were the last people to sit on those seats all night. Here is my theory, if you average a tiny little ittsy-bittsy crowd for each game, you should go out of your way to make sure those fans who do show up have a great time. And you shouldn’t go out of your way (like 150 feet) to act totally ridiculous to them. …did I mention this was 35 minutes before the game and there were like…I don’t know, you can estimate for yourself based on the photo…[insert tiny number] fans in the stadium? …and, actually, now we were sitting in the sun. Ah, yes. 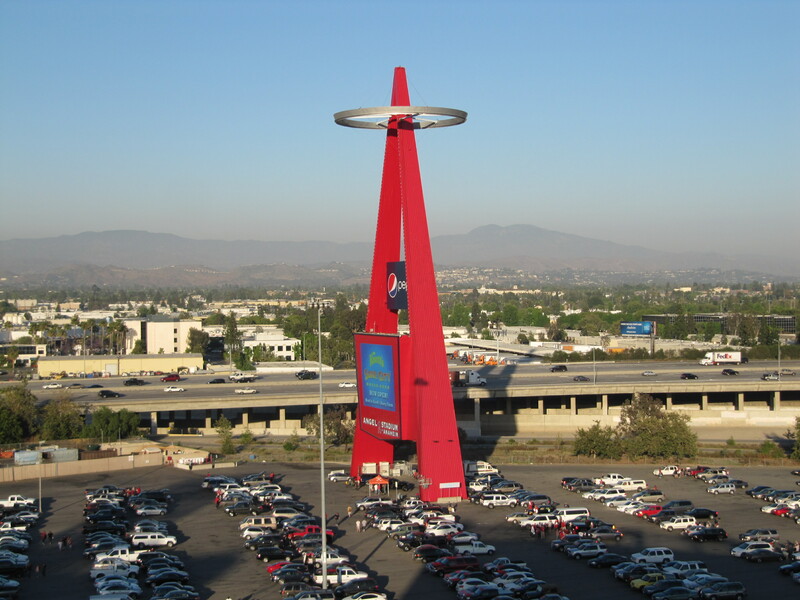 The foul pole obstruction, excellent. Actually, it wasn’t too bad. 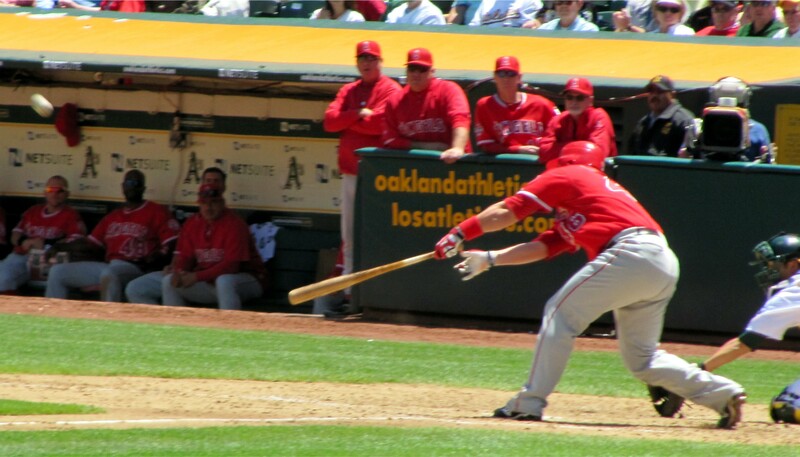 We could all lean a little to the left or right and get a clear view of home plate. 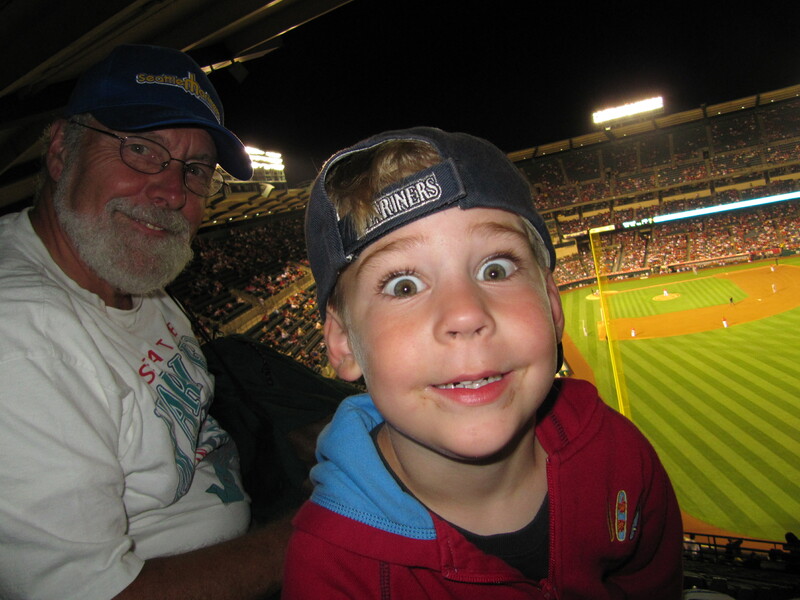 After finishing our nachos, I left Tim and my Dad at our seats and I took a little tour of the Colesium. 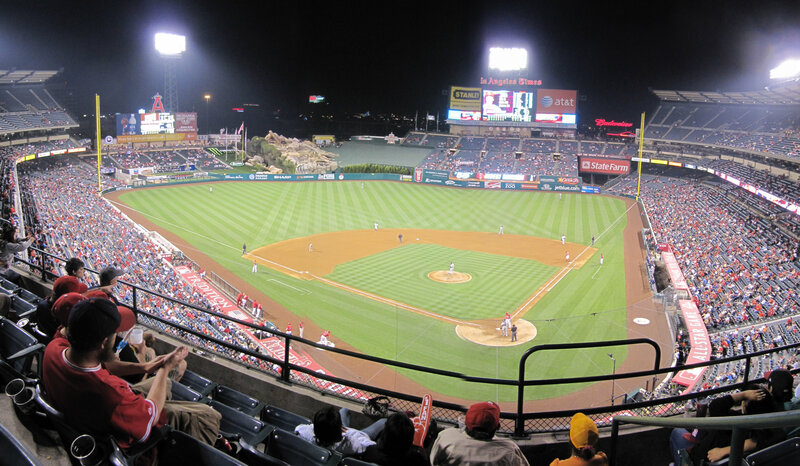 Top Left: the RF side of the big CF expansion project from however many years back. 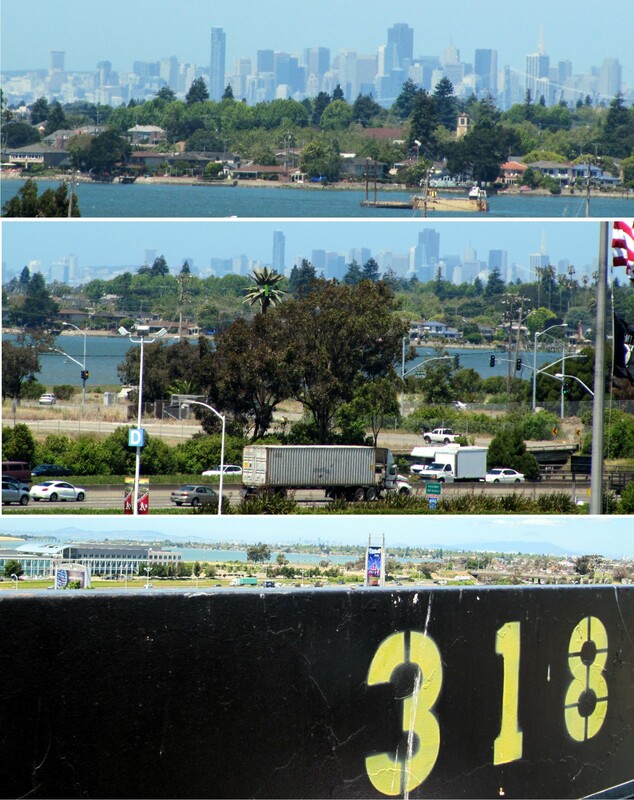 I’m not an expert on the Colesium, but my assumption is that they put this in for the Raiders. 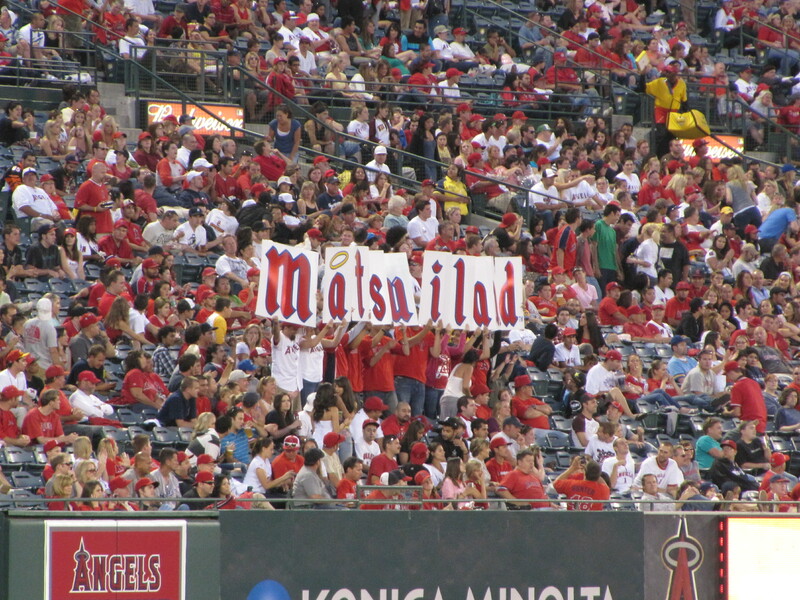 Top Middle: the LF side of the same thing. 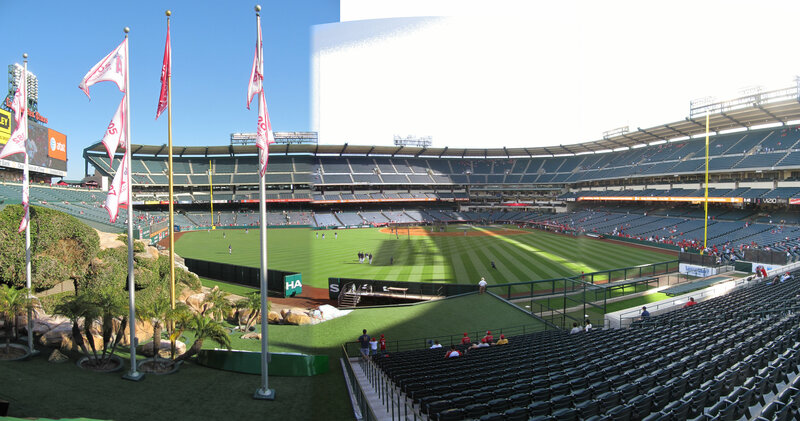 Top Right: more of the “LF side of the same thing” showing a weird little astroturf area behind the seats in LF. 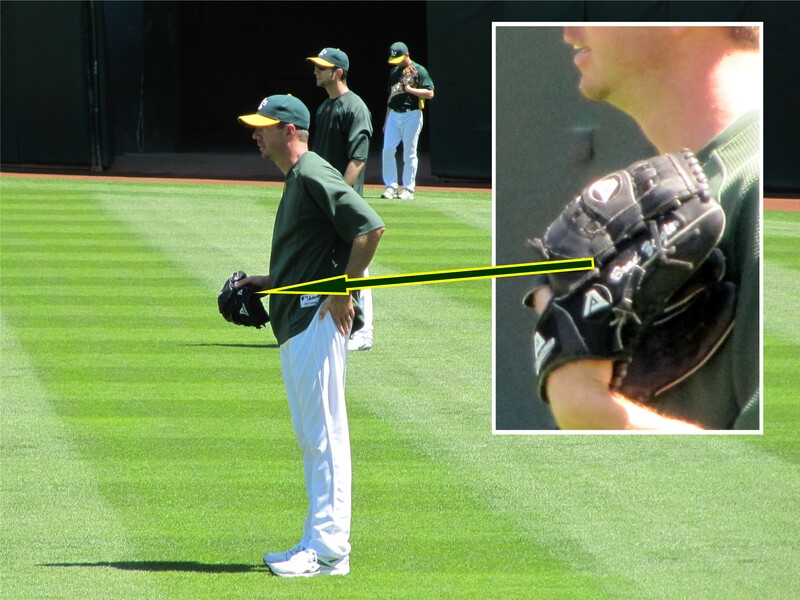 I guess they use that for something at Raiders games. 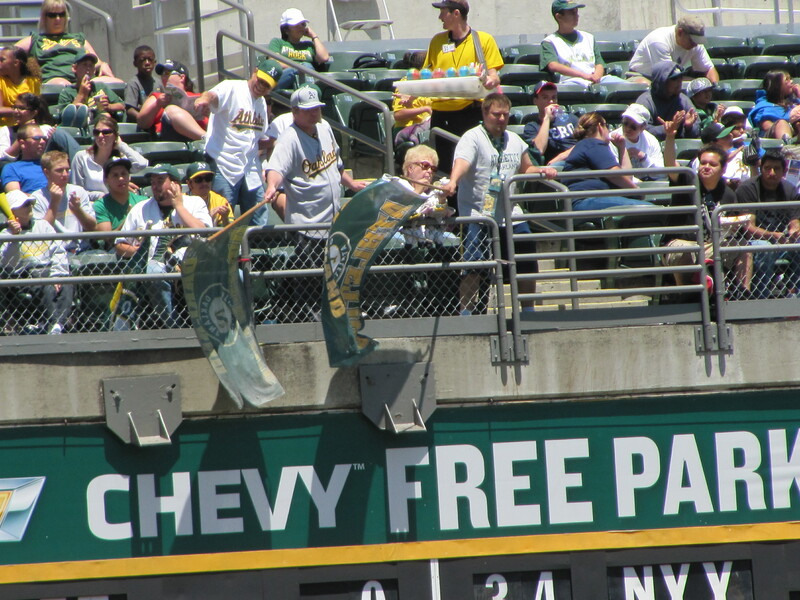 Bottom Left: A’s championship flags and the California state flag flying between the RF bleachers and the RF field seats. 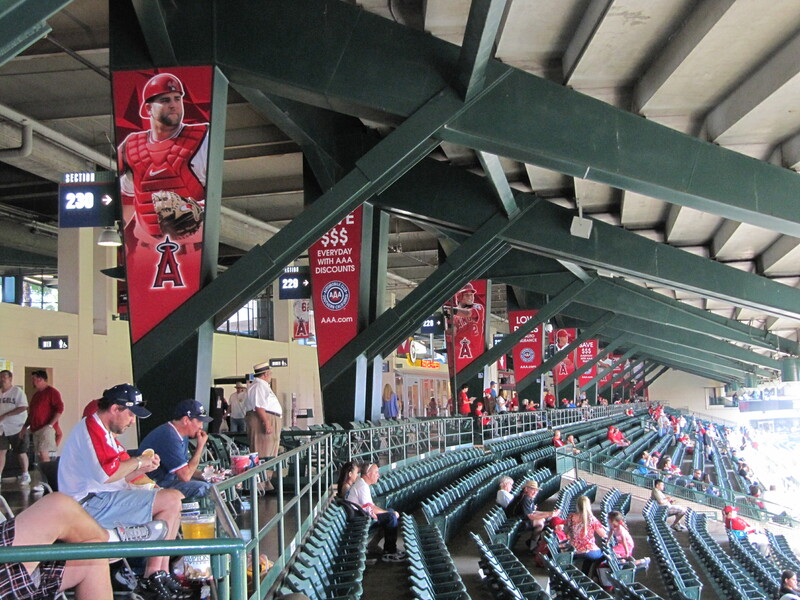 As far as I could tell, these (and similar ones in LF) are the only flags at the Colesium. I didn’t see division standings flags anywhere around the stadium. 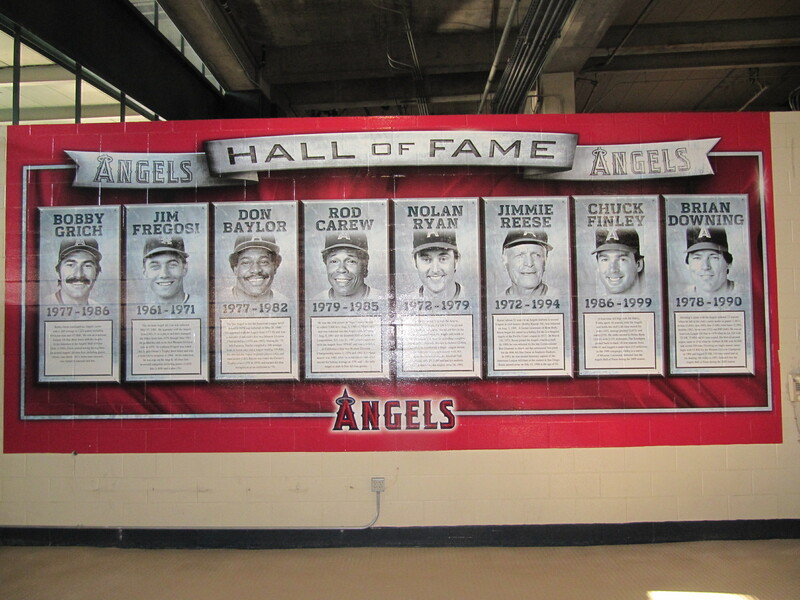 Bottom Middle: A long concrete hallway that runs the length of the outfield structure. 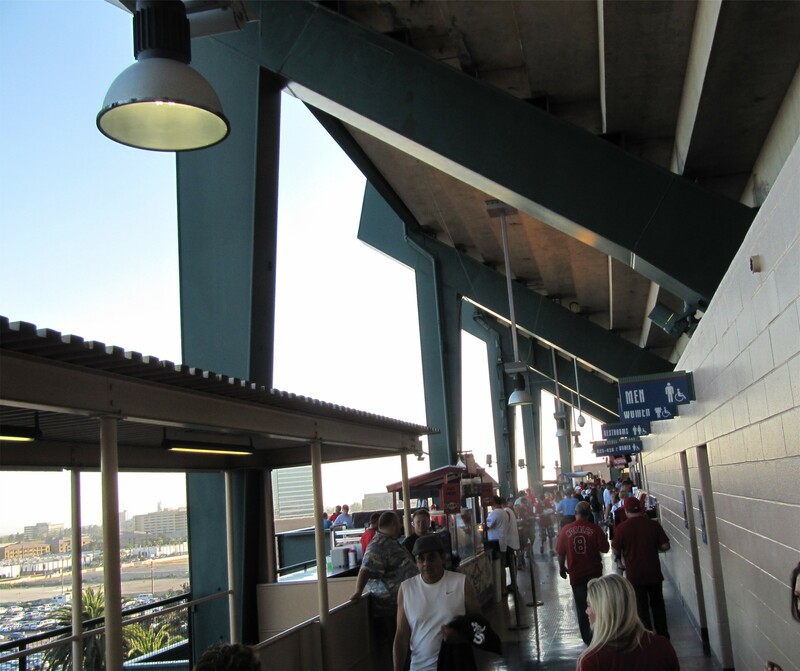 Bottom Right: a nice looking bar area that was not in operation and served only as a walkway from the RF concourse to the OF bleachers. 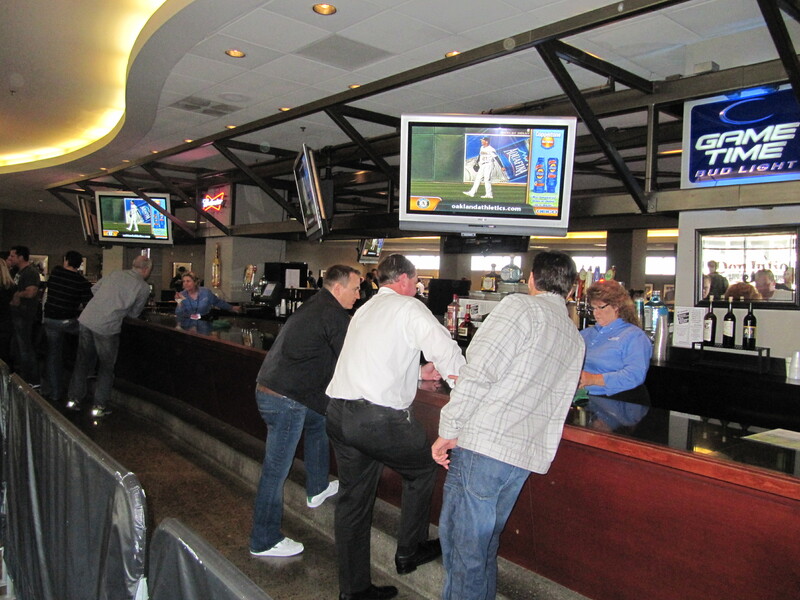 This bar and a huge congregating room at the back of the OF structure appear to be used only for Raiders games. 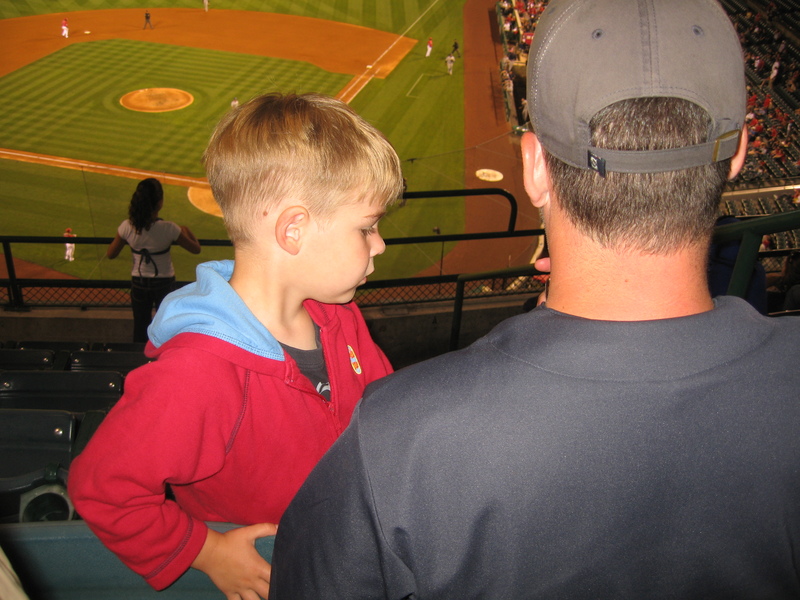 …and Tim and my Dad moments before the singing of the national anthem. 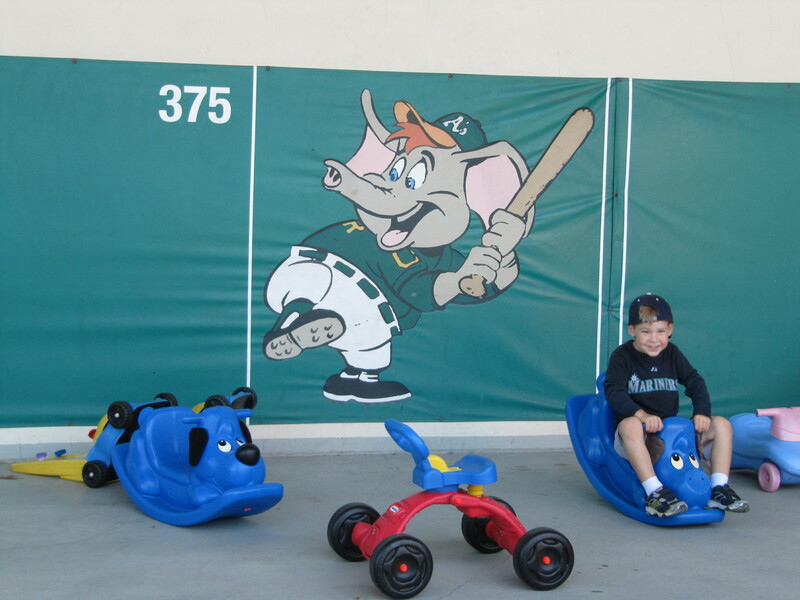 By the way, the San Francisco Giants had the same red cart that Stomper is riding in this picture. 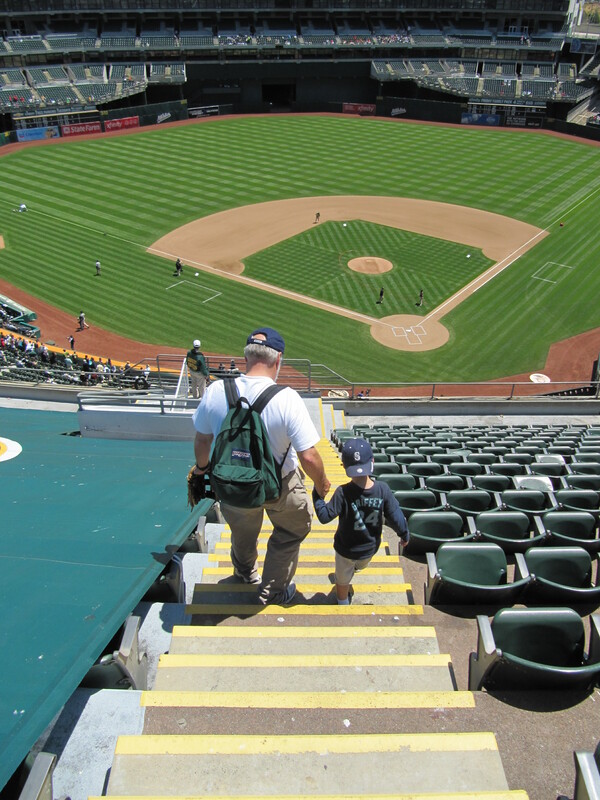 90% of the upper deck (300 level) of the Colesium is closed for A’s games, you can only get up there right behind home plate. 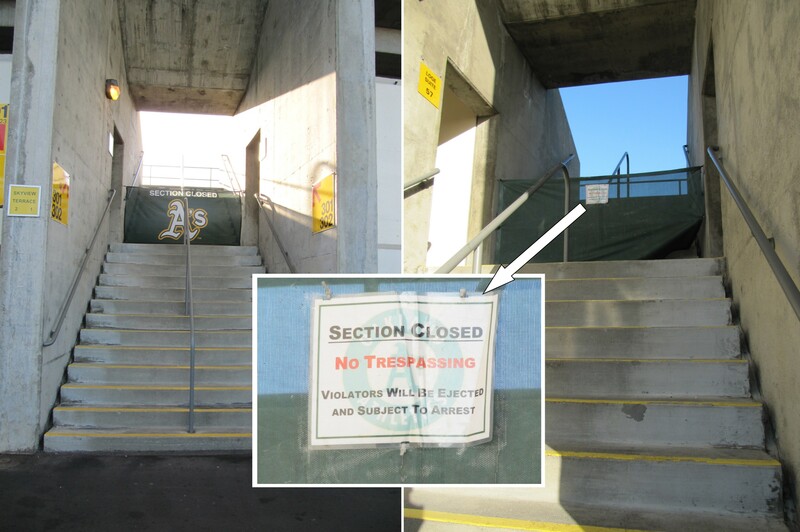 Everywhere else, you see barricades like this on the stairs up to the 300 level:. Having an entire closed down level of your stadium is not ideal. 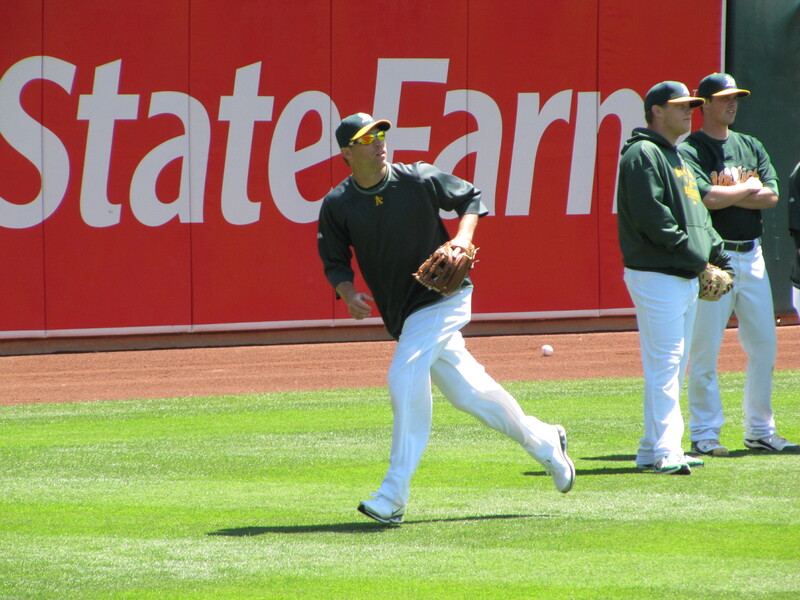 But at least some of the barricades (e.g., to the left) had nice A’s logos on them. However, as you can see, other barricades (right) just had green mesh and “no trespassing” signs. That picture is of the last suite on the 3B line. That picture might do it justice. Other than the silly barricade in the bottom left of the picture, it was a really nice looking bar. Now, here is the funny thing to think about You will be kicked out of the seats if you try to sit in the wrong seats to eat your dinner 35 minutes before the game when the stadium is essentially empty, but at any time with any ticket you can come and sit in this nice warm restaurant and eat your dinner with no questions asked. 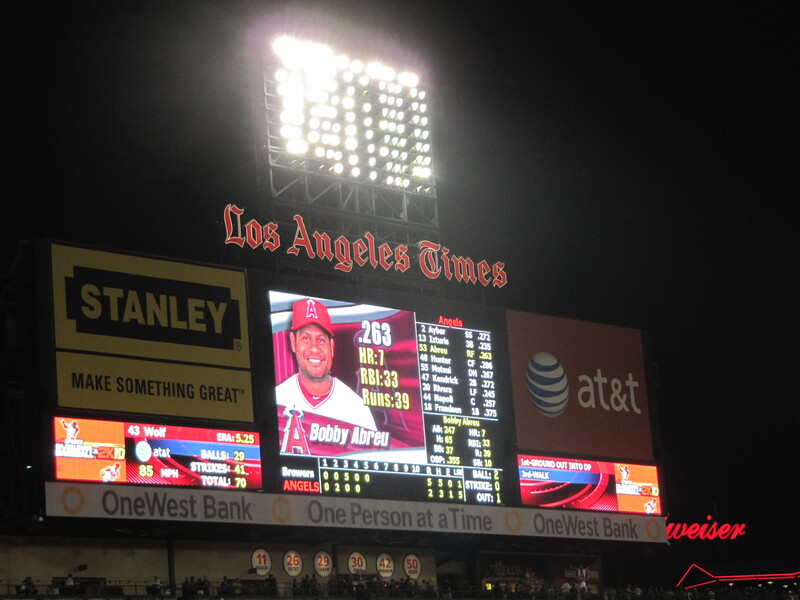 …but he was not perfect on this night. 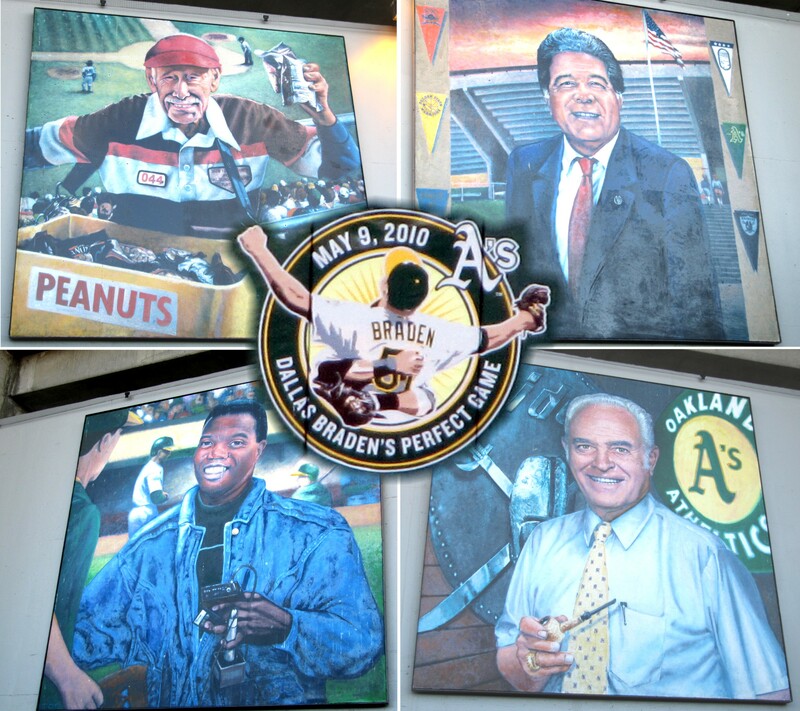 Really, my favorite thing was the painting of the peanut man. 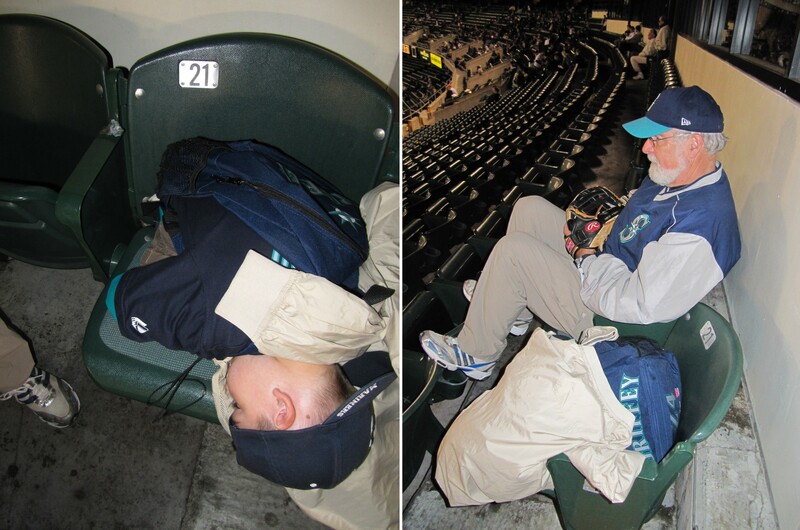 I have a soft spot in my heart for Mariners peanut man (“The Peanut Man”) Rick Kaminski. I think characters like The Peanut Man really enhance the fan experience and should be celebrated by the organization. 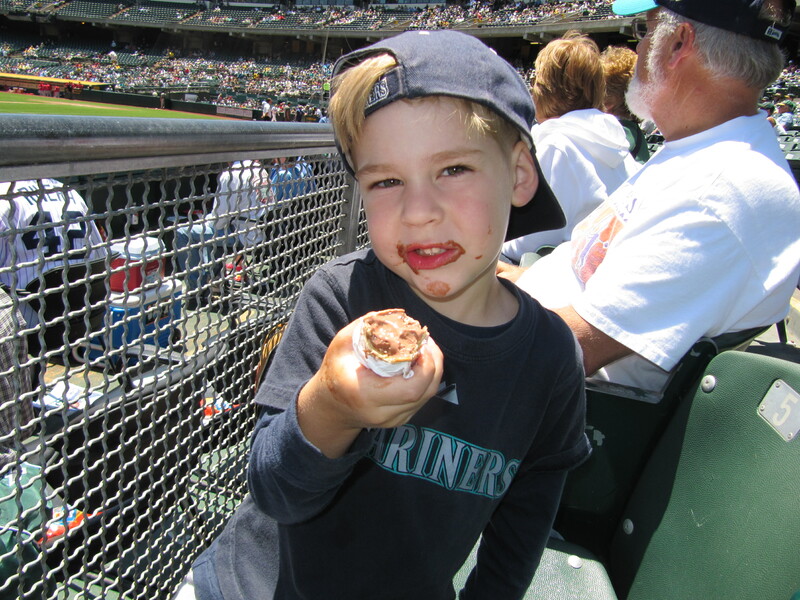 Someday, I hope the Peanut Man is enshined in the Mariners Hall of Fame. 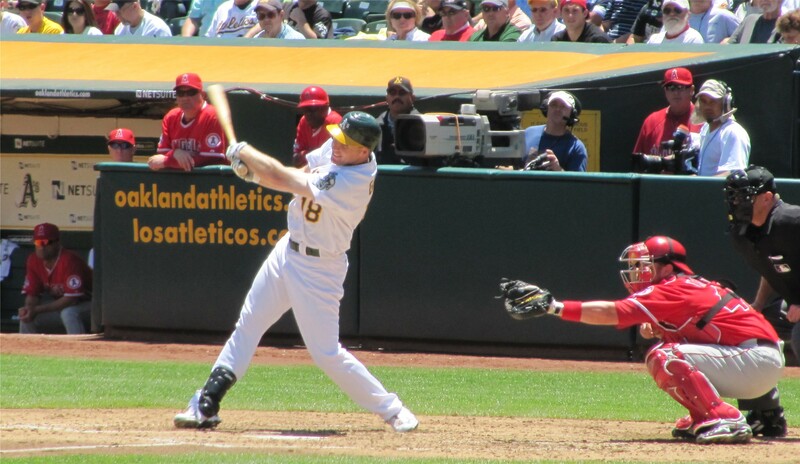 At minimum, he deserves an awesome painting like this hanging at Safeco Field. 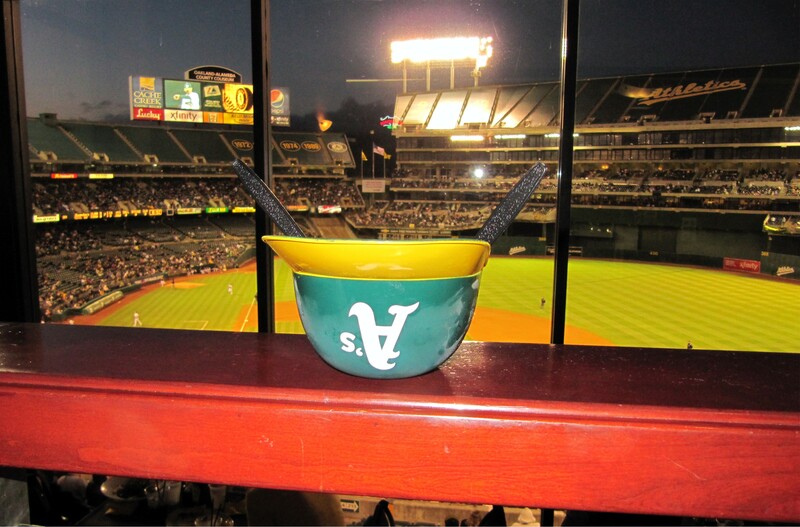 I really hope this peanut man is a real A’s (or Raiders) peanut man — that woul be pretty awesome. 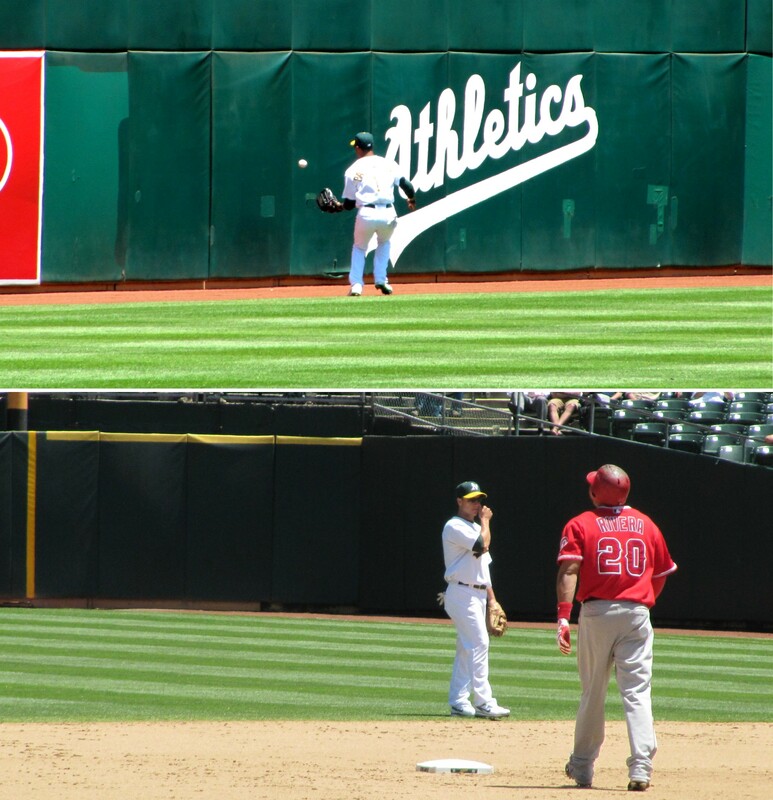 By the way, the picture of Dallas Braden in the middle is actually on the outfield wall in LF (I just cut and pasted it into that picture of the paintings). 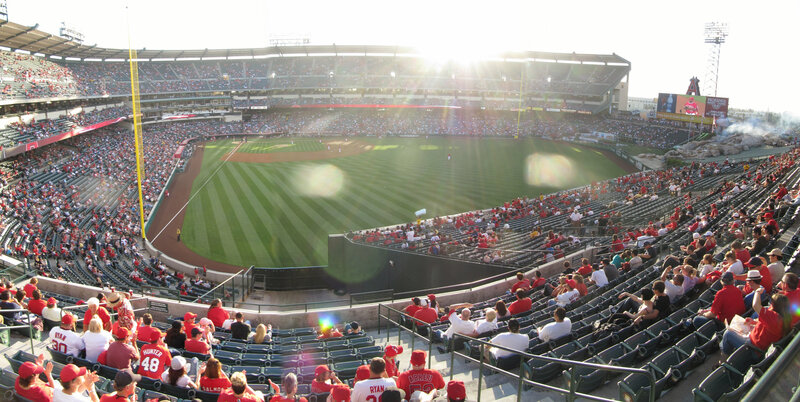 By the time I got back to the seats, it was cold and windy (despite the sun shining bright on us). I was not prepared. It had been a hot day. In the northeast, when its a hot day, the nasty humidity makes it a hot night and you don’t need to bring jackets, etc. to the game. Not the case in California. It got cold and windy and I didn’t have a jacket or a sweatshirt for Tim. 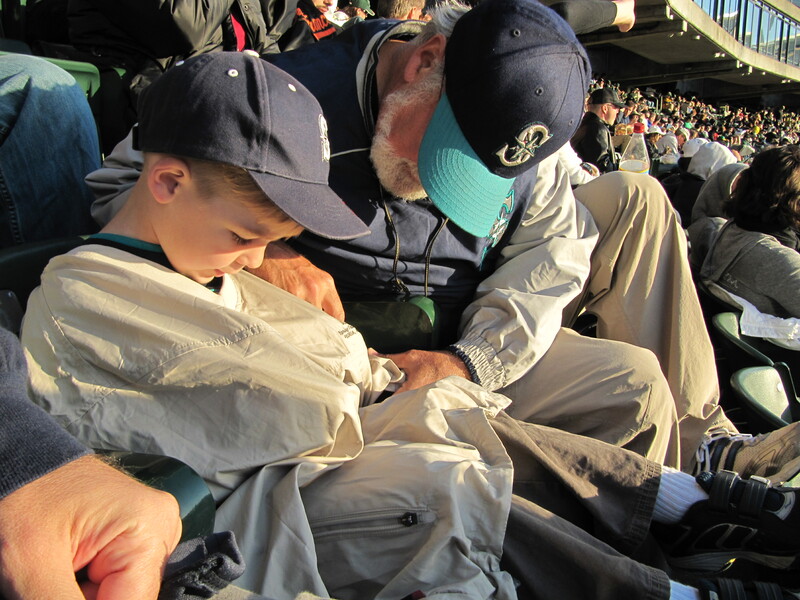 Luckily, my Dad had an adult-sized light jacket for him to wear:. 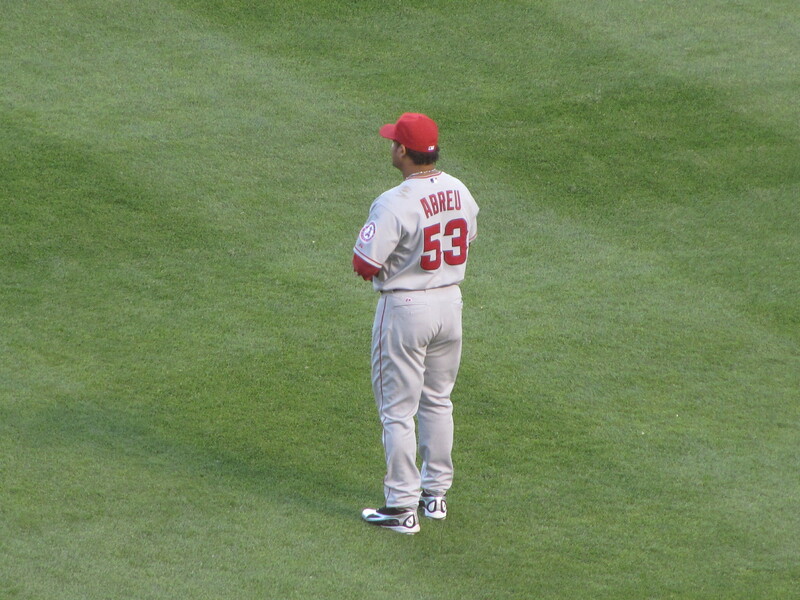 I’ve liked Abreu since his days in Philadelphia. I met him once and he was really cool. 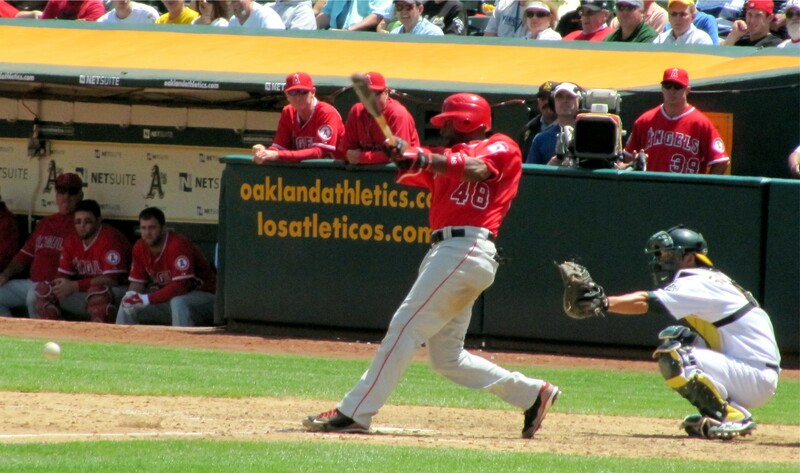 And he’s one heck of a hitter. 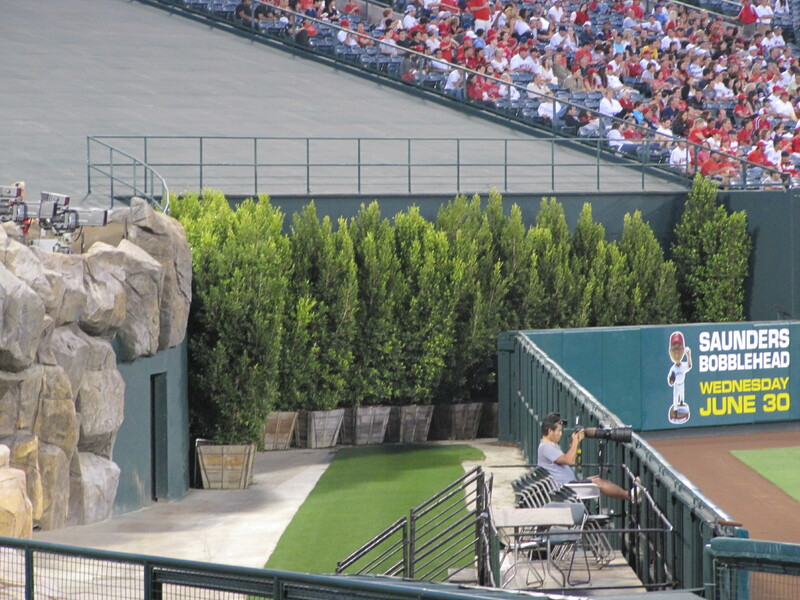 There is no direct passage from the dugouts to the clubhouses so the players have to walk through a pathway by the fancy seats behind home plate. 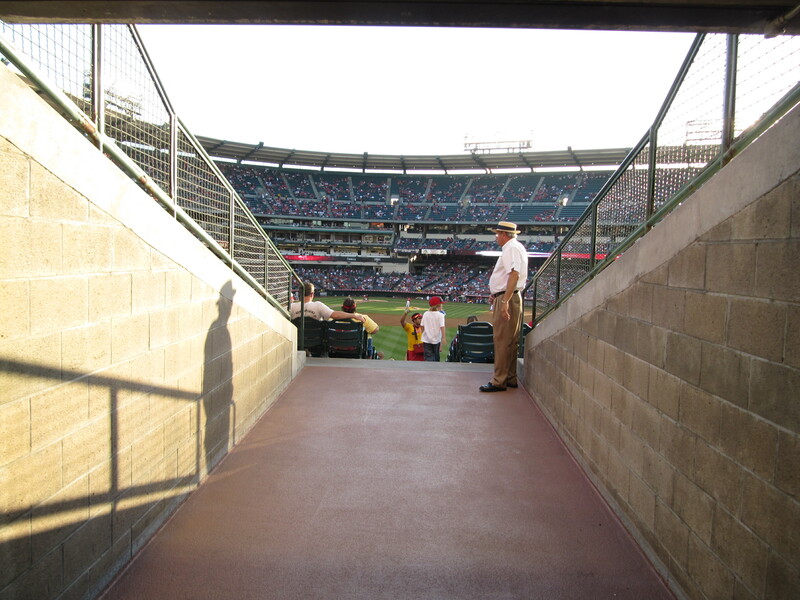 The umpires also enter and exit through this little walkway on the 1B side. We like mascots. And Stomper is a good looking mascot. 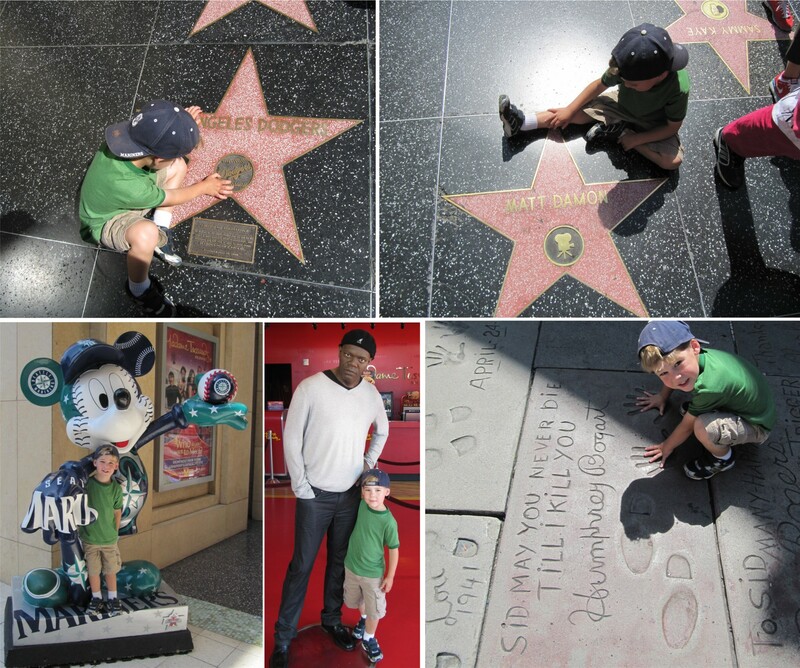 After posing for a picture, Stomper played a little “give me five, up high, too slow, down low, too slow!” with Tim. Next, Tim and I were off to the kids play area. Three words sum it up: weak, extremely weak. 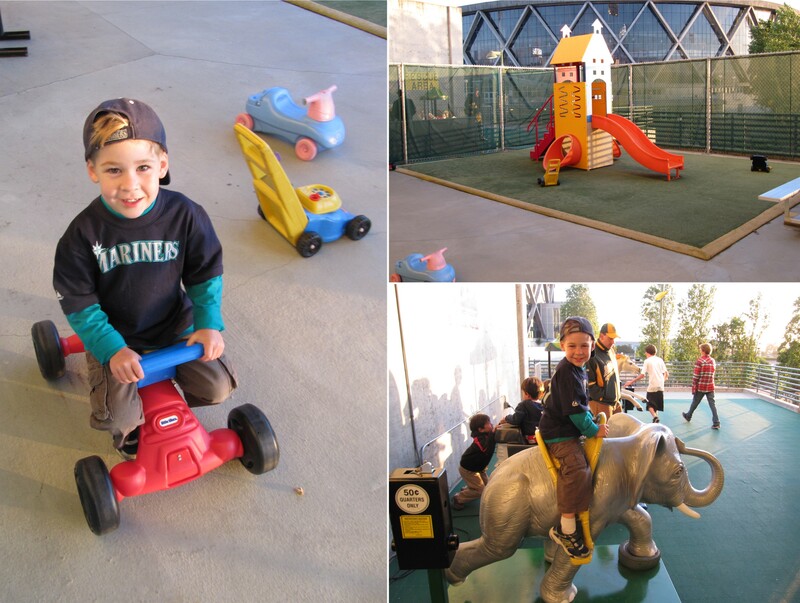 Actually, Tim had a lot of fun in the play area, but compared to other stadiums (like Philadelphia or Washington, D.C.) this place just does not cut the mustard. First off, you had to pay for the little rides with tokens that I never even saw where to get them. And at least one of the rides was broken down. 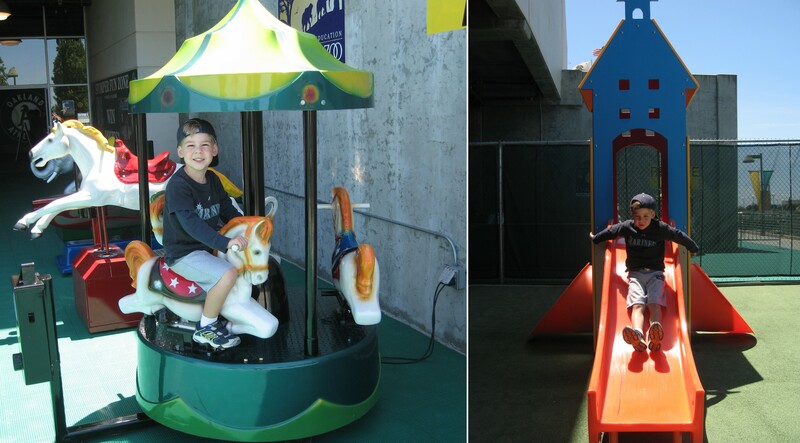 The actual playset looked like it should be in a fan’s backyard, not at a MLB stadium. 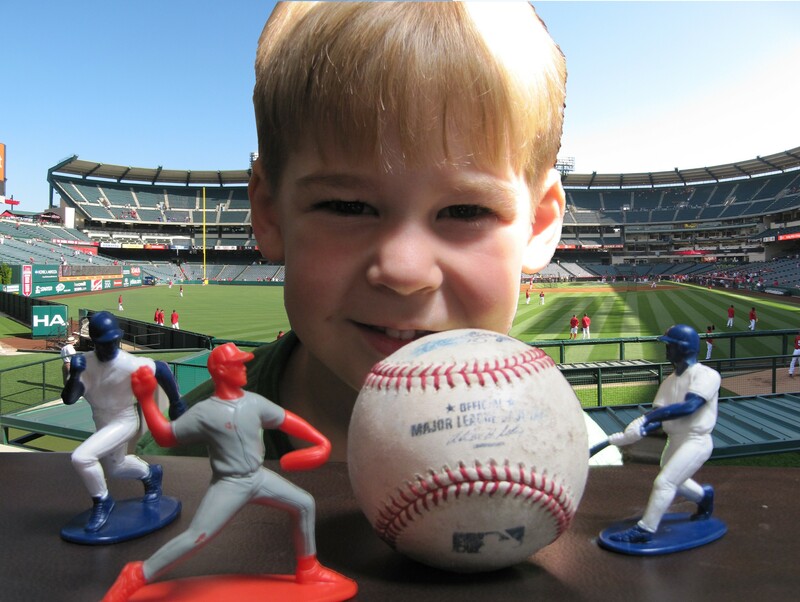 To see what a real MLB quality playset should look like, click here. Stomper, as I just said, is a cool MLB mascot. He’s a legit Big League caliber mascot. 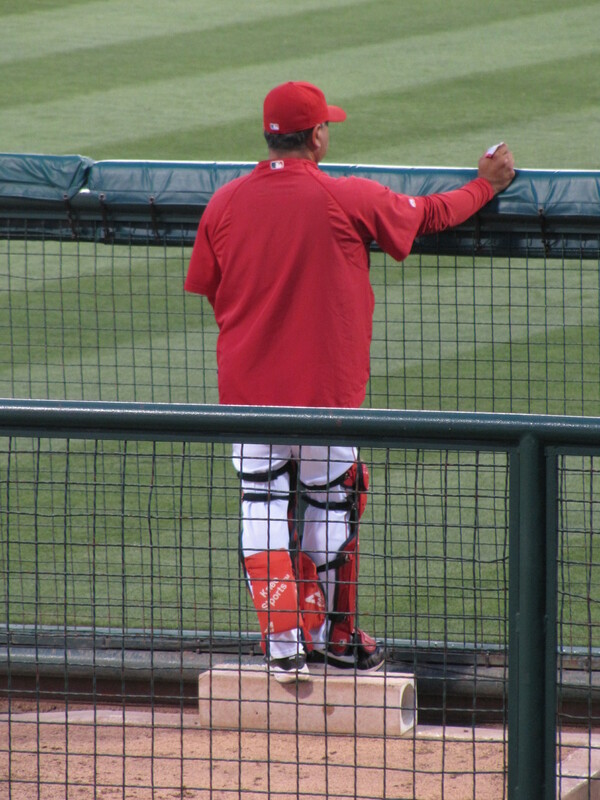 But each game, he has to come sit on this disgusting trash-heap of a “throne” to sign autographs. 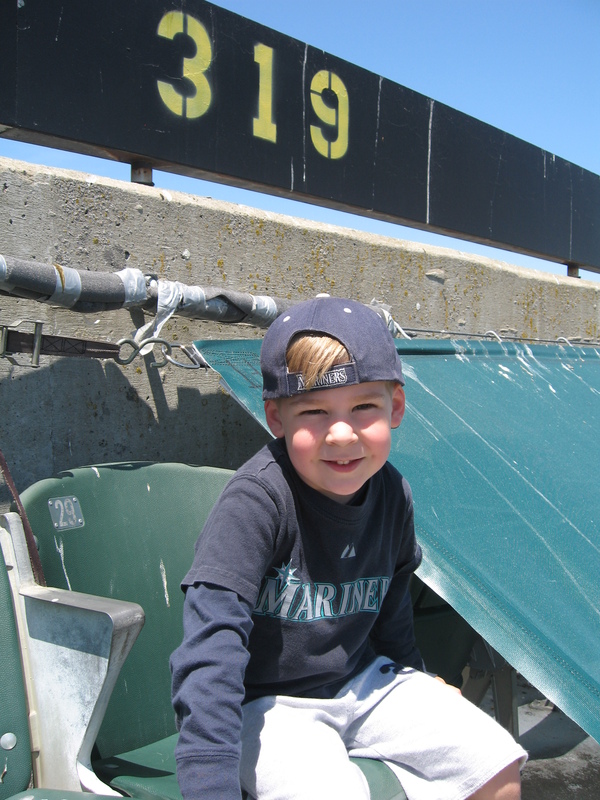 Check out the (i) ripped seating area (not just to astrosturf seat, but the padding under it as well), (ii) the pealing striped poles, and (iii) the dirty and pealing baseballs at the top of the columns. Worst yet, the whole “throne” shook like it was going to fall apart. 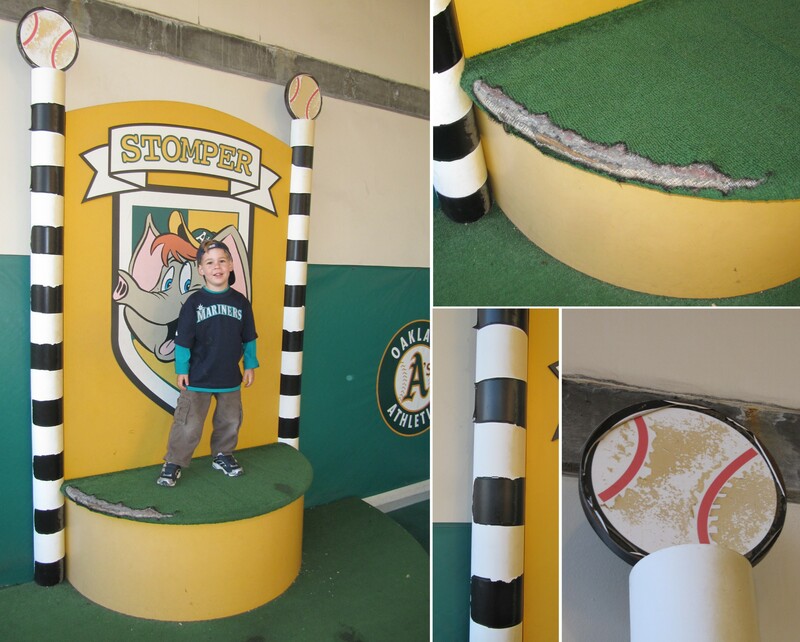 I was seriously embarrassed for Stomper that the A’s make him sit on this piece of garbage. He unquestionably deserves better than this. 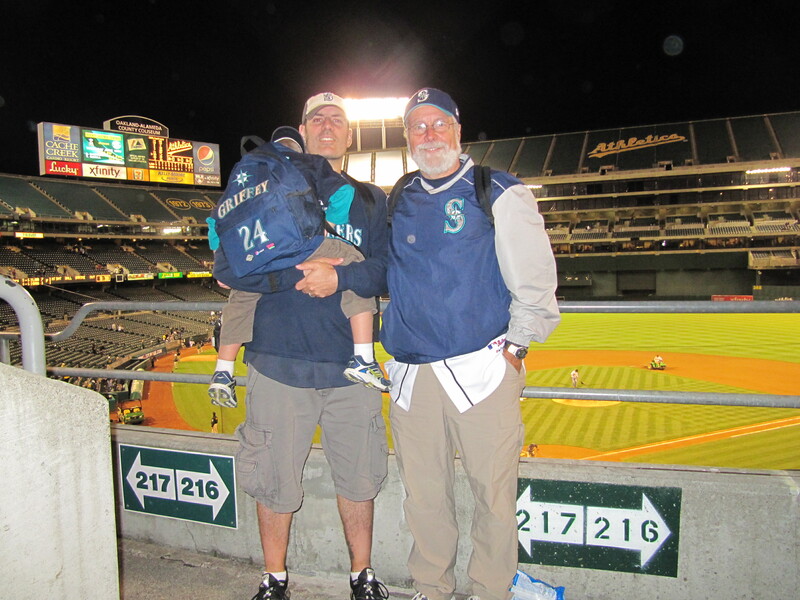 After meeting up with my Dad again in our seats, we determined that it was officially freezing cold. We decided to go to the West Side Club. 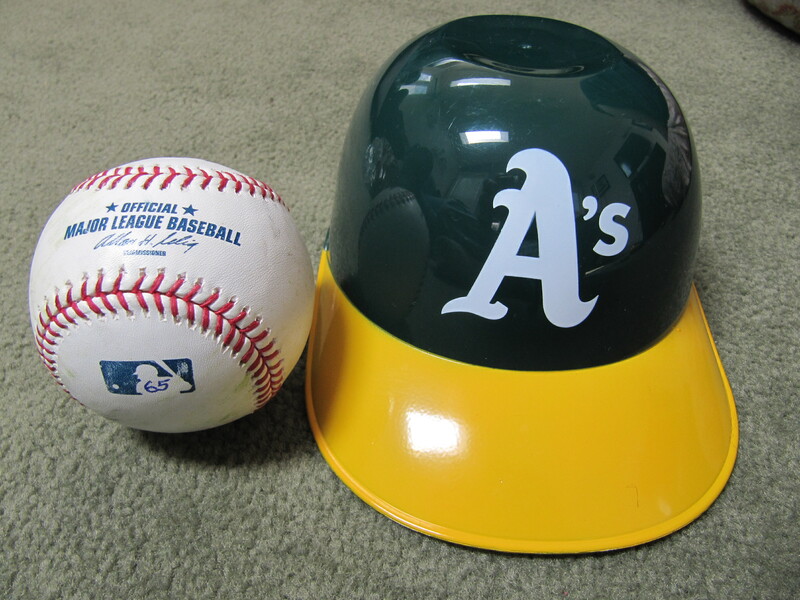 …and Tim and I got an ice cream helmet for two! It was $10 and it came with hot fudge and caramel topping, plus whipped cream and cherries on top. Excellent. And it was warm and toasty in the club. 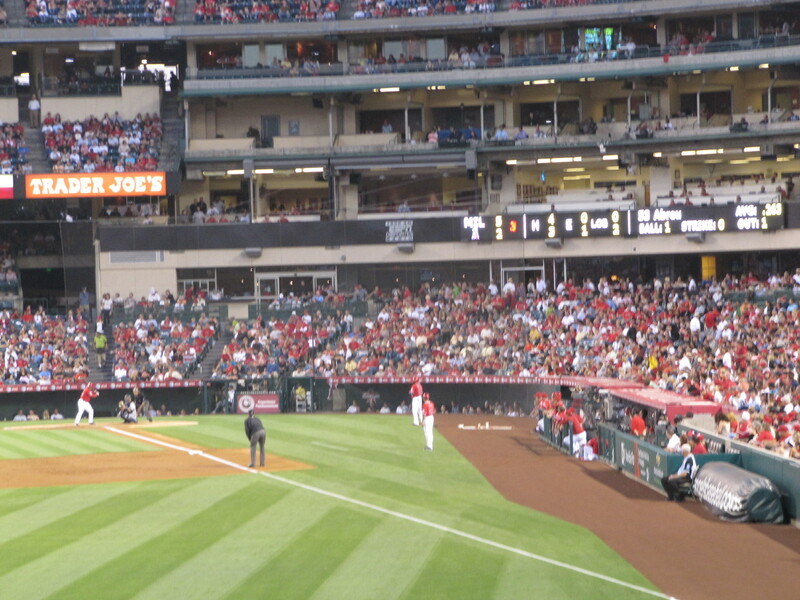 While we were in there, two people caught foul balls right outside of our window — within 30 feet from us. So we headed out there for the end of the game. 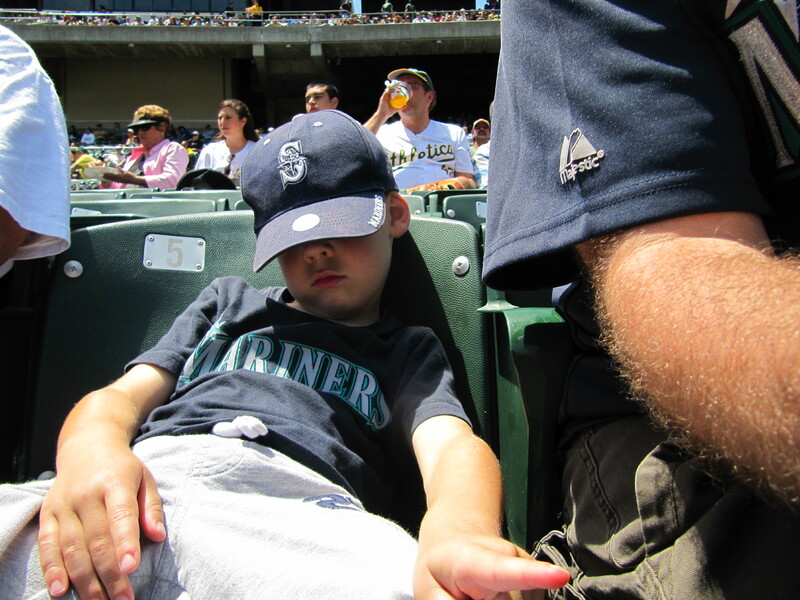 It was past 9:00 p.m. Pacific Time, and Tim and I had been awake since about 4:00 a.m. Eastern Time, so he promptly crashed out in a most awkward position in the seats as my Dad and I watched the end of the game:. 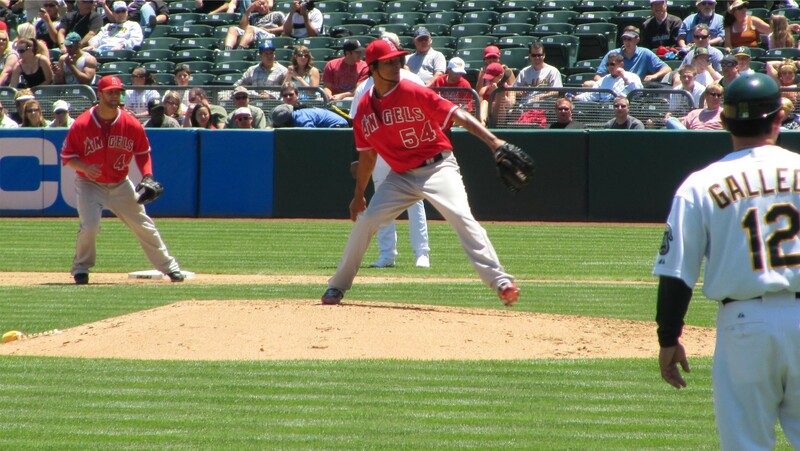 The Angels won 7-1 on the strength of a complete game by Joe Saunders and the hitting of Eric Aybar and Torii Hunter. 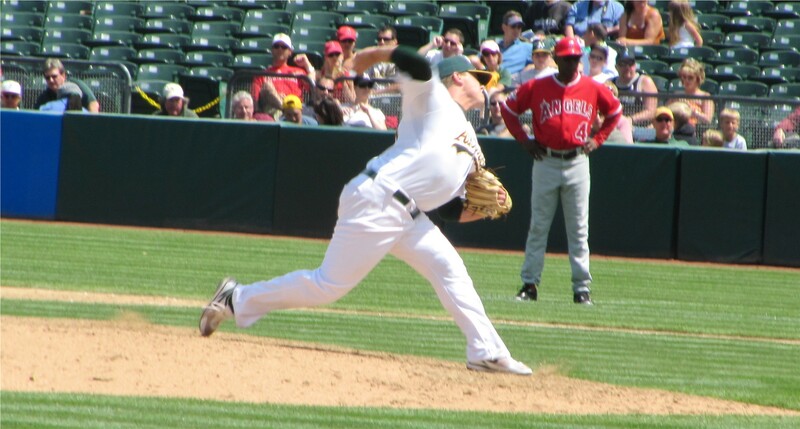 The A’s did not score their sole run until the bottom of the 9th inning. 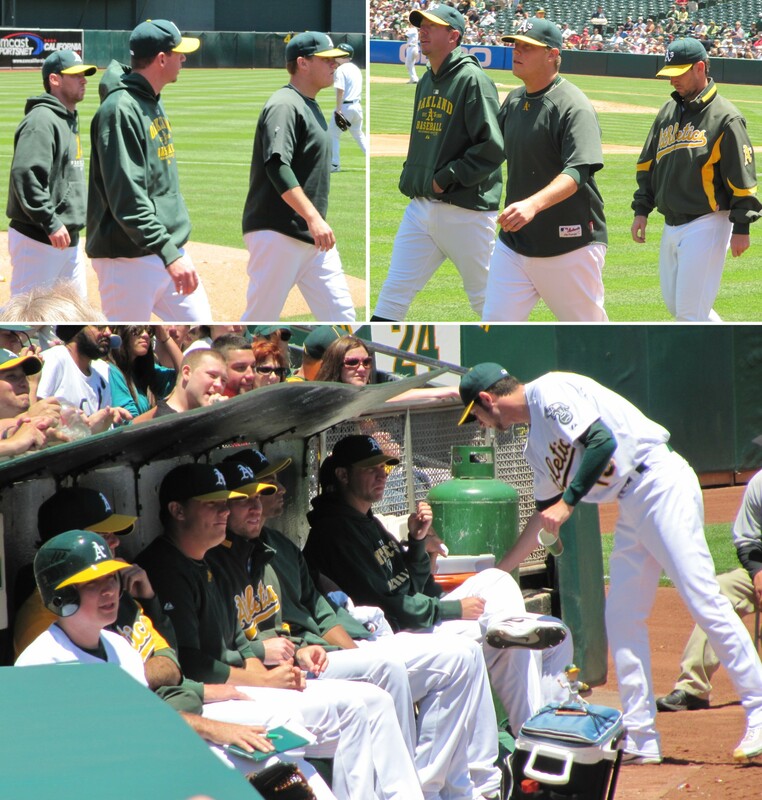 The small crowd gave a hearty cheer as the A’s scored and avoided a shutout. 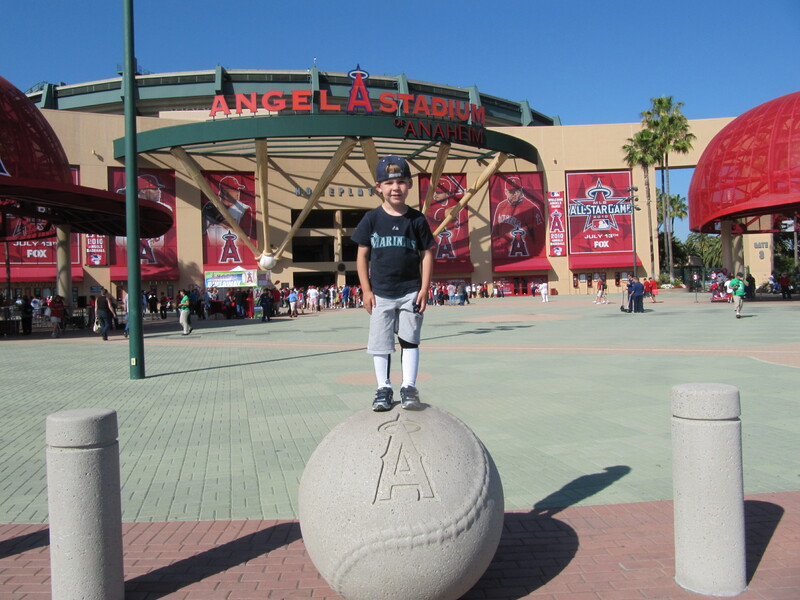 Since the Angels won, we’d be rooting for the A’s the next day so the teams would split the two games and have little to no effect on the Mariners large hole in the AL West standings. 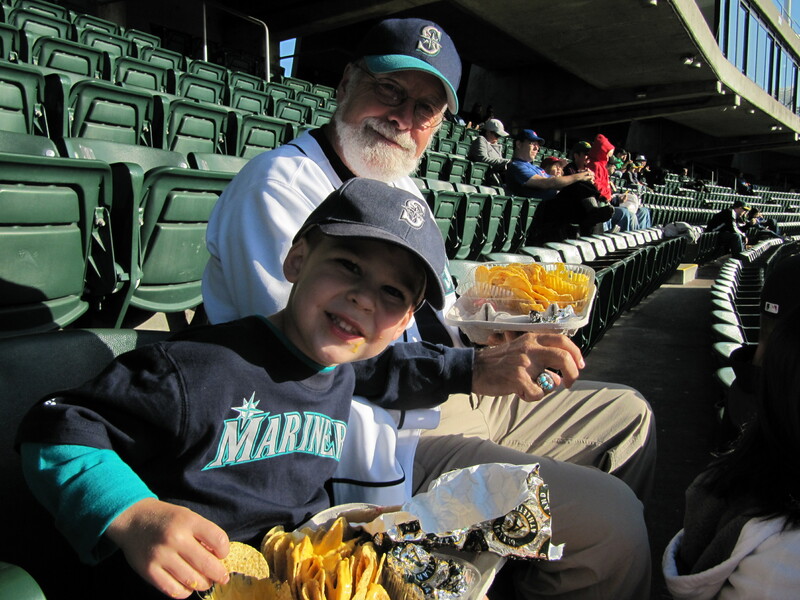 Despite the Colesium’s and the ushers’ shortcomings, we had a very nice time at our first game on the GFS. We would be back for more within 12 hours with a new, refreshed and positive outlook on the Colesium.